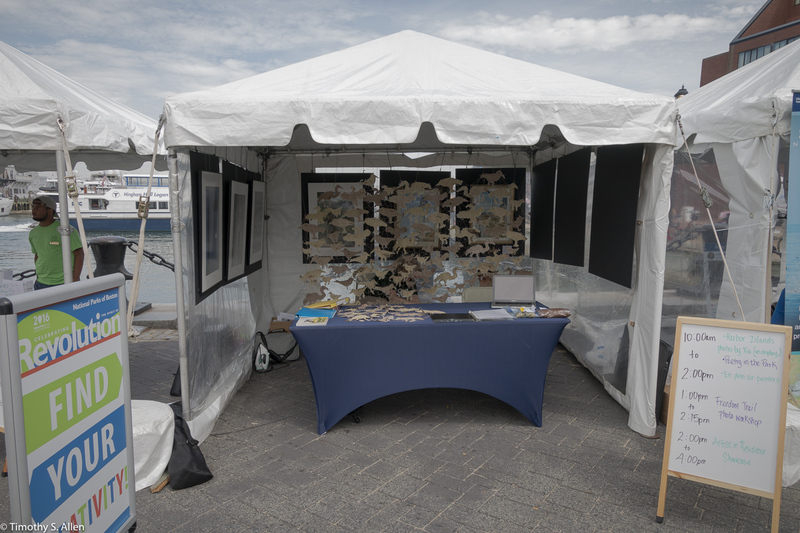 During my final three days as an artist-in residence on Peddock’s Island, I put together the finished artwork for installation at the Boston Harbor Island Welcome Center, Long Wharf in downtown Boston. 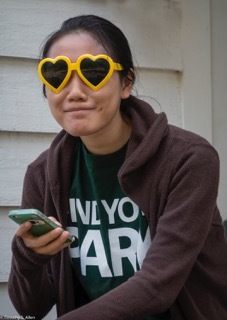 The site chosen for the art installation is a large window space that allows visitors to see the artwork from both directions and at all times of the day or night. 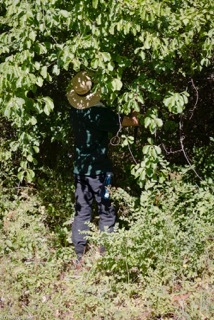 It can be viewed from the street outside the Welcome Center even if the Center is not open. 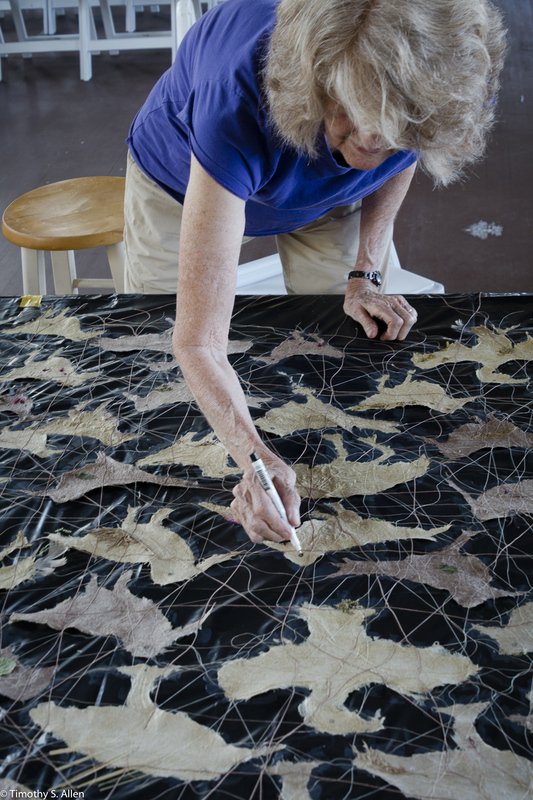 During the office hours the Center is opened up and people can see the artwork from both sides. 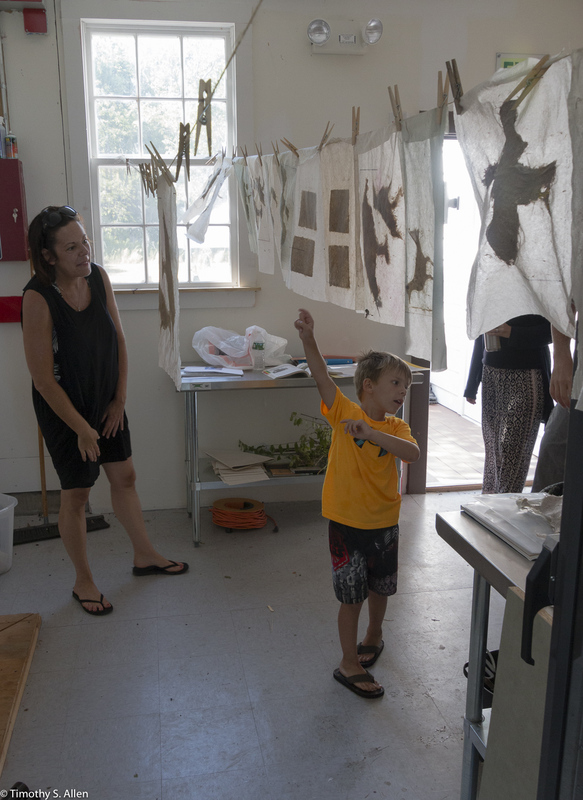 This window space is about 9 feet long and 3 feet high, and the artwork is suspended from the ceiling a few inches away from the glass so that a black window screen can be pulled down at night. 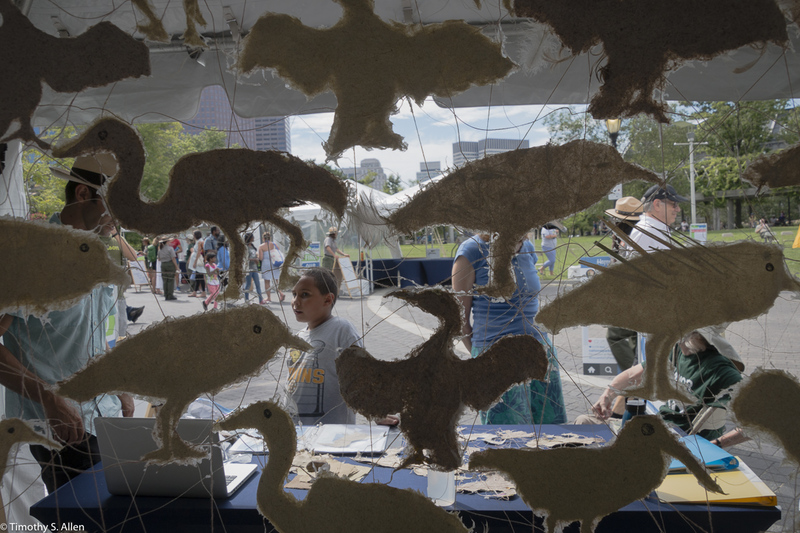 It is an interesting site for the artwork about Peddock’s Island Birds and made with handmade paper from invasive plants, created with public participation by visitors to Peddock’s Island. 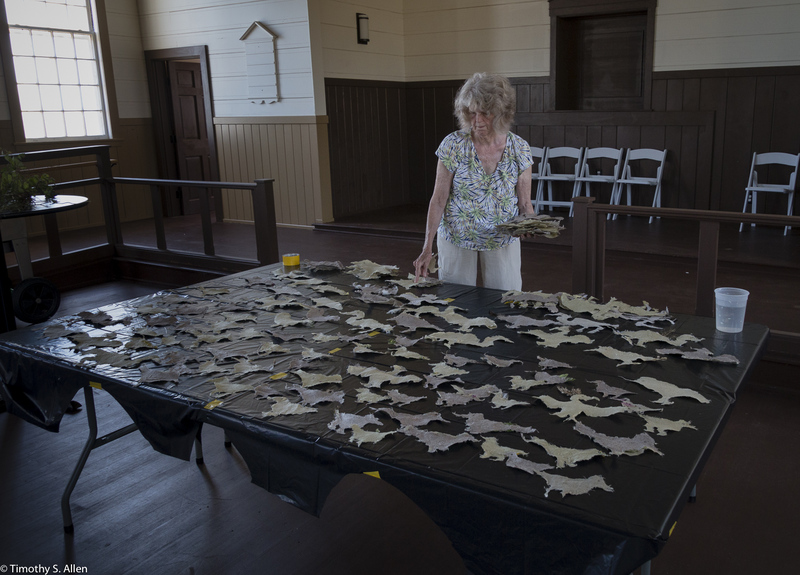 I put the piece together inside the chapel on Peddock’s Island. 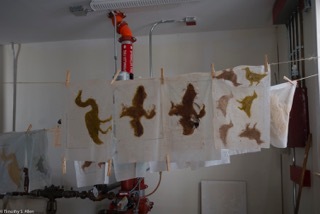 I had to choose from the more than 160 handmade paper birds to put together the finished artwork. 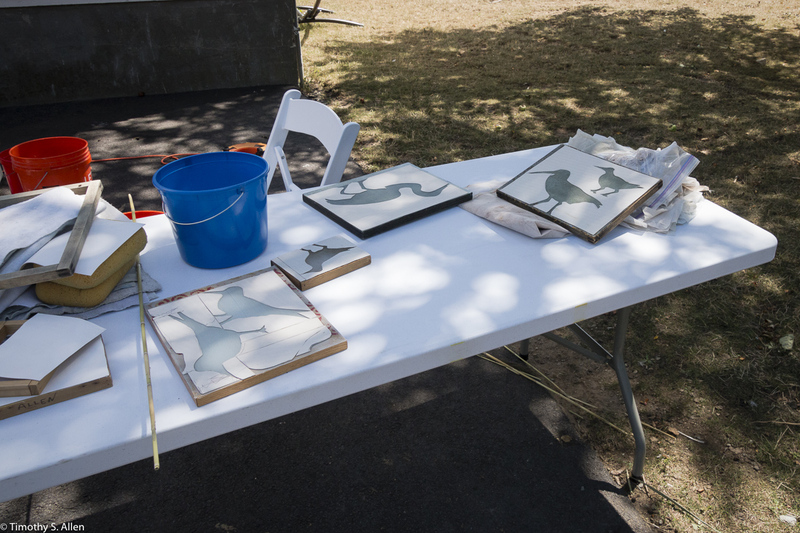 Some of the left over birds will be used for other smaller pieces and to give to the volunteers and participants. 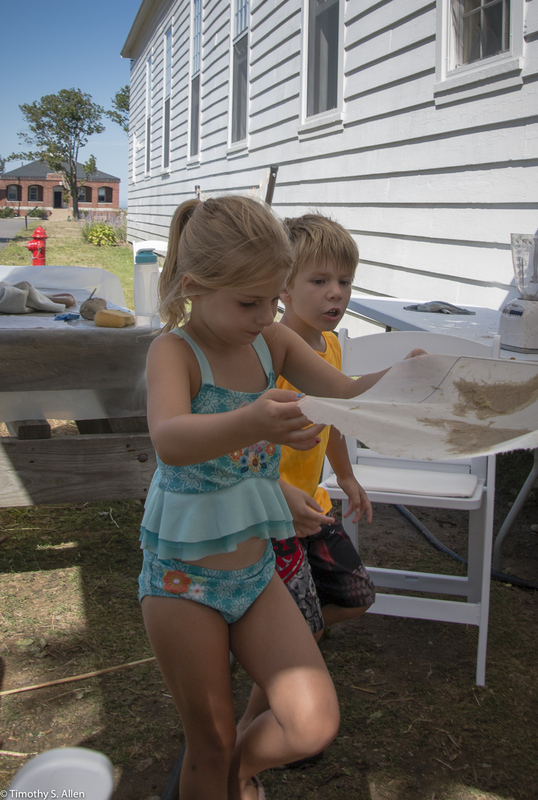 Many of the handmade paper birds were made by public participants in the weekend papermaking workshops I held on Peddock’s Island August 20 and 21. 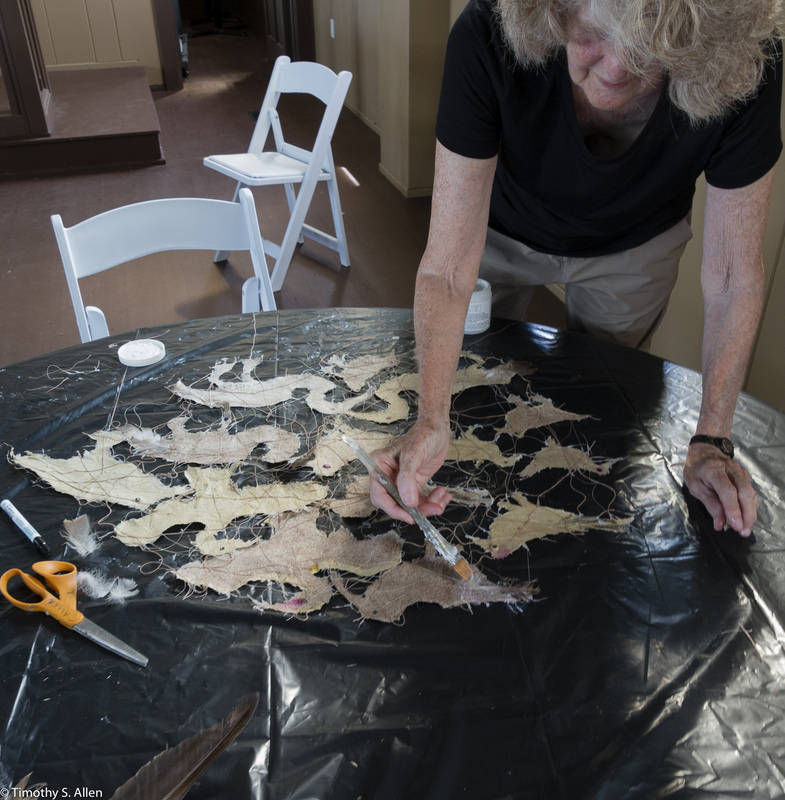 The handmade paper birds were laid out on plastic sheeting so as not to harm the tables, and I used natural cotton string in brown, beige and natural colors to join the bird shapes creating a sort of net-like background for the piece. 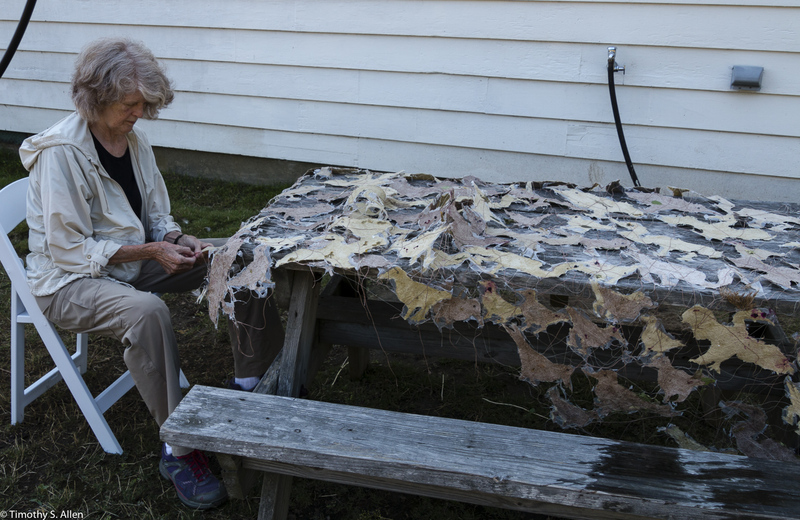 The birds represented in this artwork are all water birds (herons, egrets, cormorants, sandpipers, oystercatchers, and terns) found along the shores of the islands, and I also used some goose feathers (they have many Canadian geese living near the chapel on Peddock’s) and leaves, wildflowers and other found natural objects from Peddock’s Island in the finished artwork. 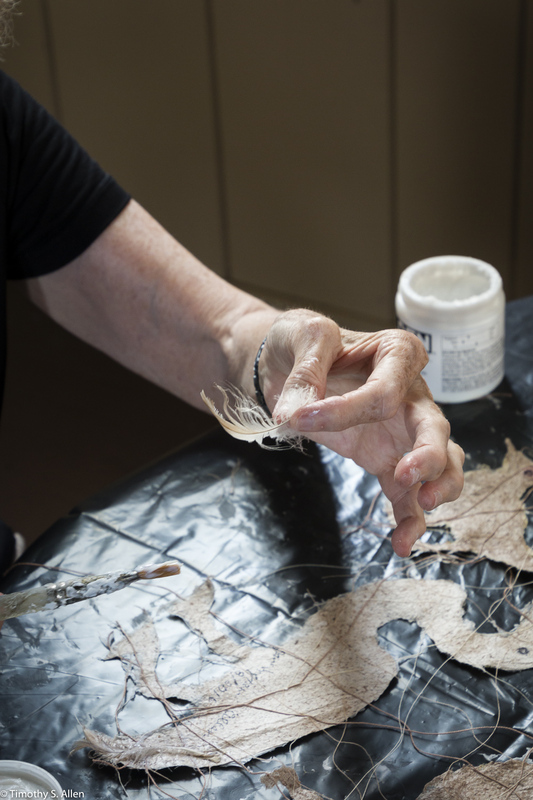 I used acrylic matte gel as a glue to put everything together glueing the string across the handmade paper birds and attaching the wildflowers, leaves, feathers, etc. 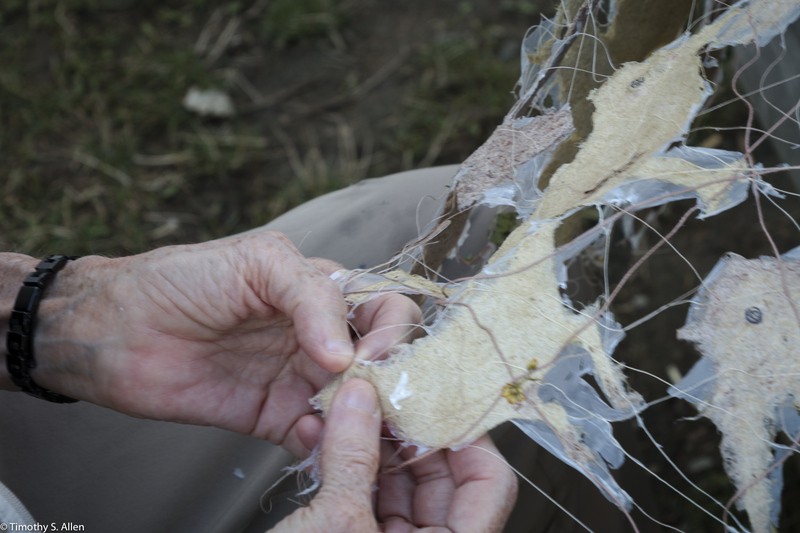 Then when the gel dried I peeled the whole piece off the plastic with the interwoven threads holding it all together. 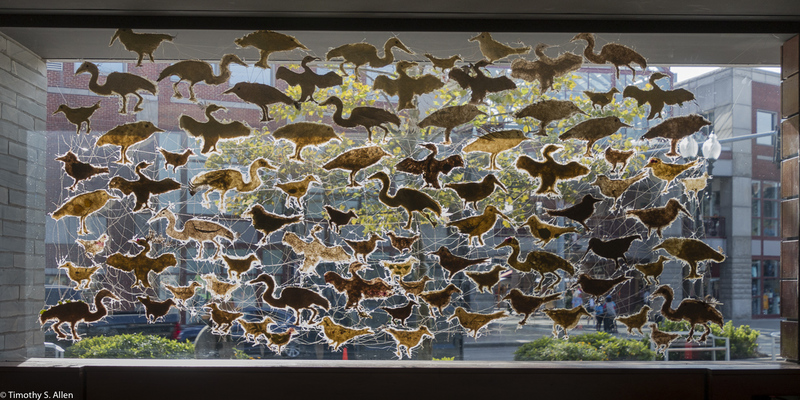 I had to pick out some of the excess gel in the negative spaces since I wanted the artwork to be as transparent as possible so that light could come through it in the window space. 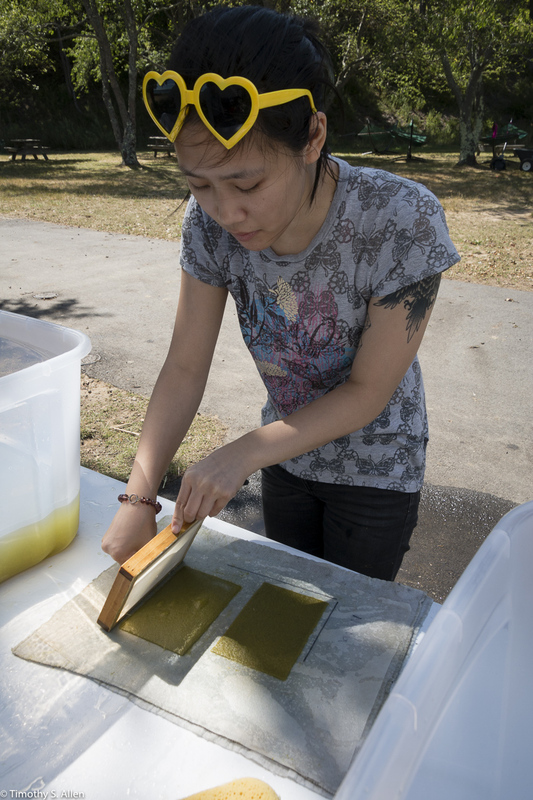 The gel also makes the handmade paper and natural string piece more lasting and gives it a UV protectant. 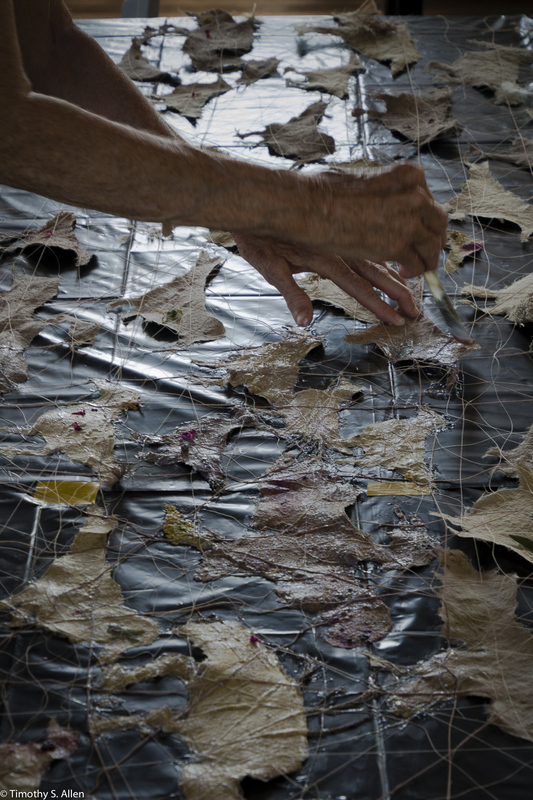 The artwork is an irregular organic shape and has thread loops at the top to hang easily from ceiling hooks. 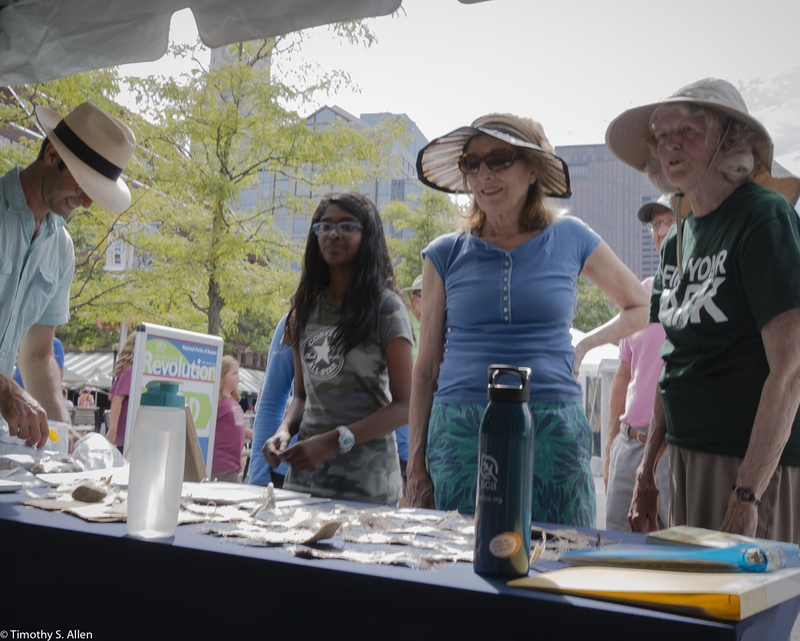 On August 25 at Long Wharf I participated in the celebrations for the 100th anniversary of America’s National Parks. 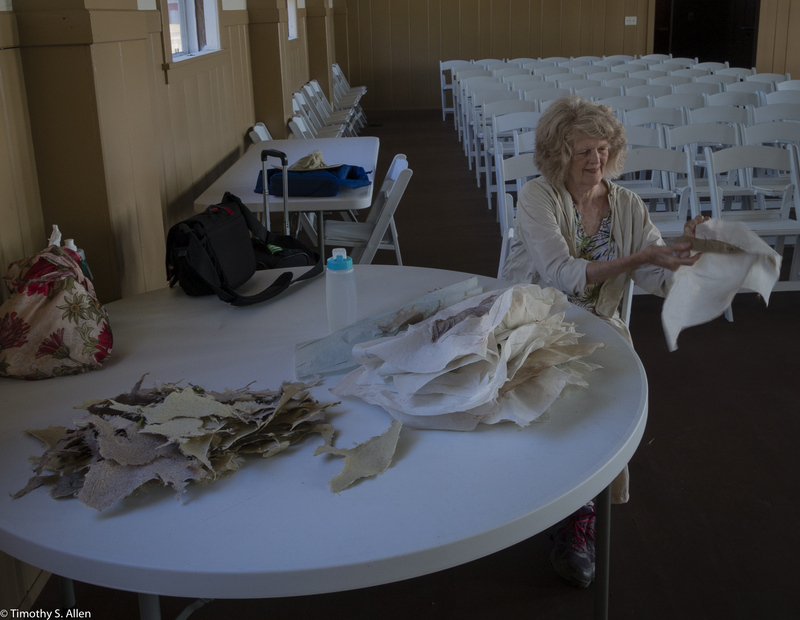 I had the finished handmade paper artwork created during my residency hanging in a tent booth there and samples of the birds and the handmade paper made from invasive plants. 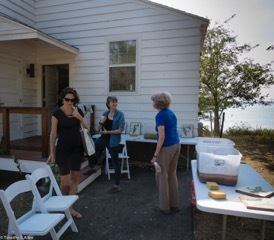 It was great to talk with visitors there about the artist in residency project on Peddock’s Island. 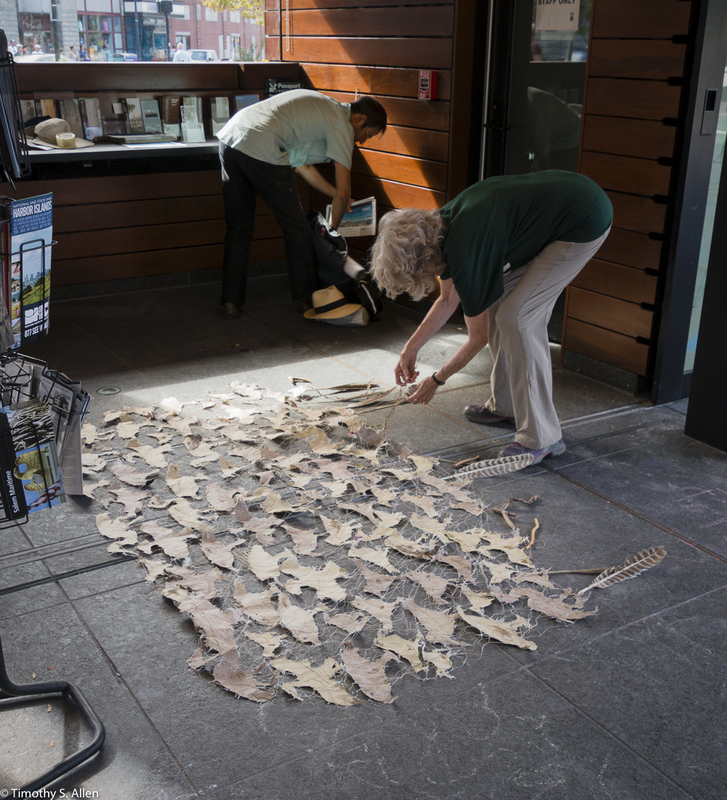 These photos show the installation going up at the Welcome Center for the Boston Harbor Islands near Long Wharf in Boston. 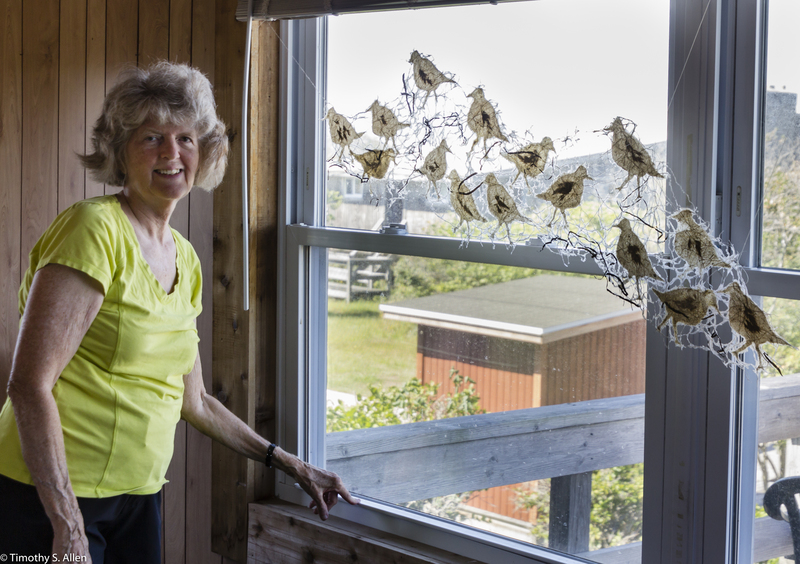 Thanks to volunteer Bob Marcus and my husband Tim for their great help in getting the piece hung in the window space. 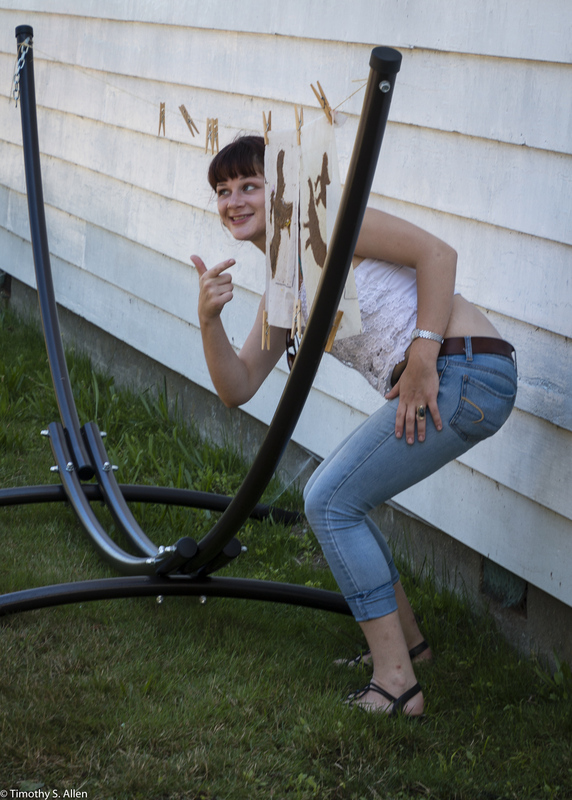 We only had about 45 minutes to do the installation since they were due to close up the Welcome Center at 5 PM. 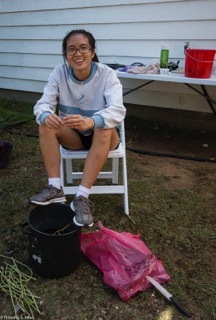 These photos were taken by Tim very late in the day with the sun low in the sky behind the window, so I hope we can go back one morning to get more photos in a different light. 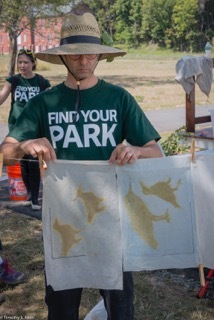 Also, the Park staff will be putting up a sign to identify this artwork and tell a little about how it was made. 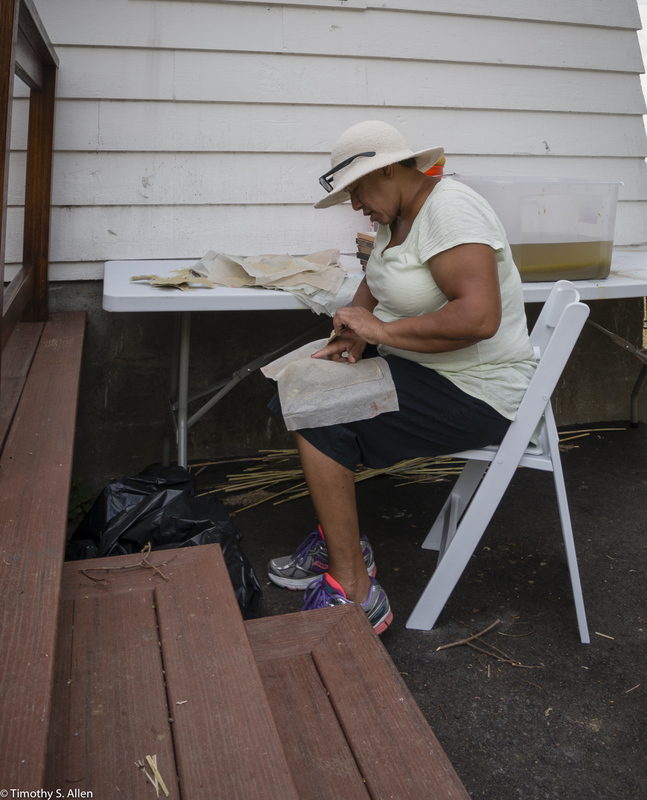 I have also completed the Peddock’s Island handmade paper recipe book that gives information about making paper from three invasive plants: Phragmites or common reed leaves, Oriental Bittersweet Vine bark and Bell’s Honeysuckle vine bark. 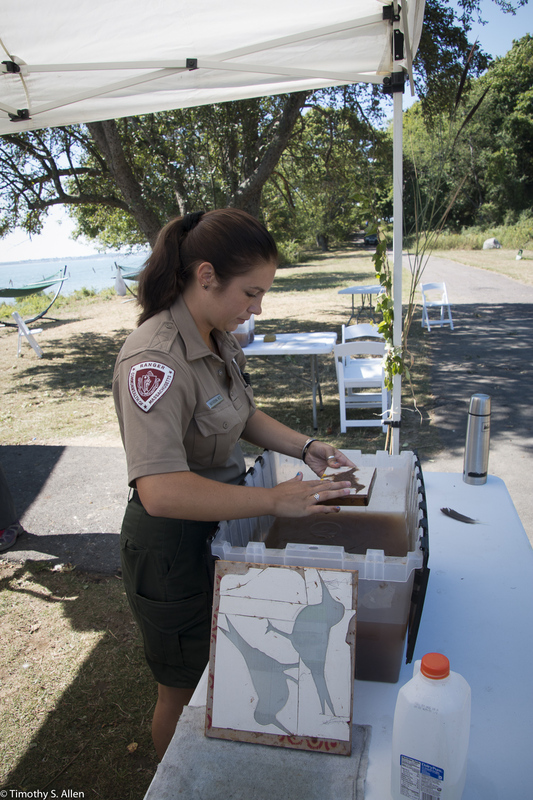 This book will be left at the Boston Harbor Islands National Park Welcome Center too. 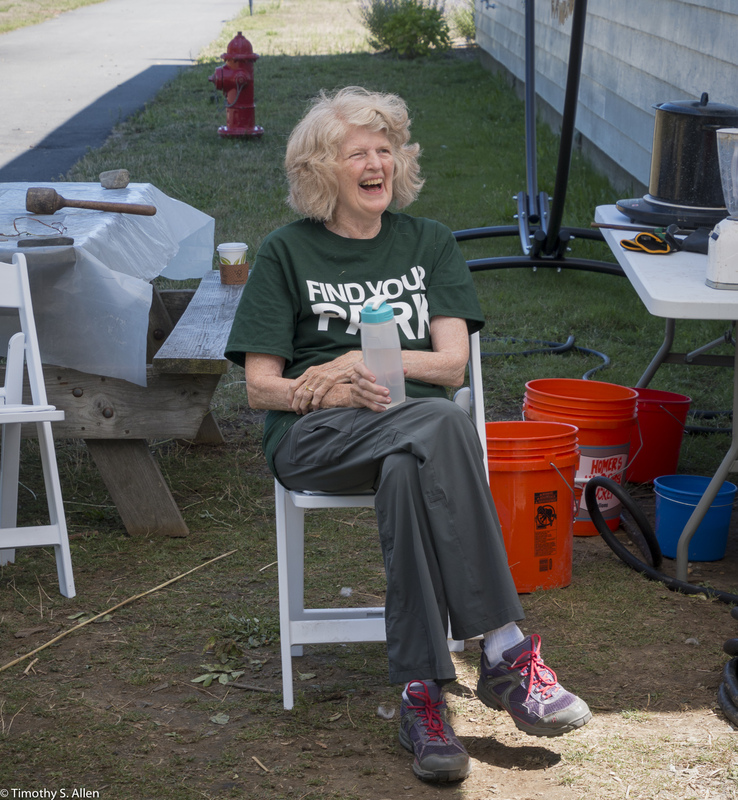 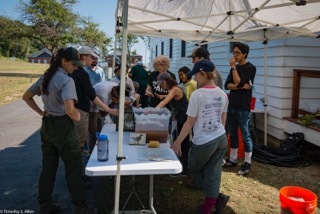 Thanks again to the volunteers, the park rangers, Carolyn Lewenberg who was the Artist in Residency coordinator, and the staff at Boston Harbor Now for all their help and support during this residency project. 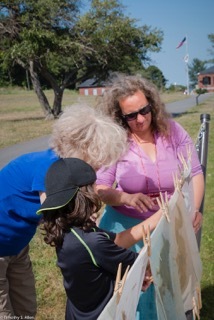 I really enjoyed this experience being the first artist-in-residence at Boston Harbor Islands National Park, and I hope that the program will continue with all sorts of artists working on the islands to make art there that can enhance viewers experiences and inspire people to preserve the harbor islands for future generations. 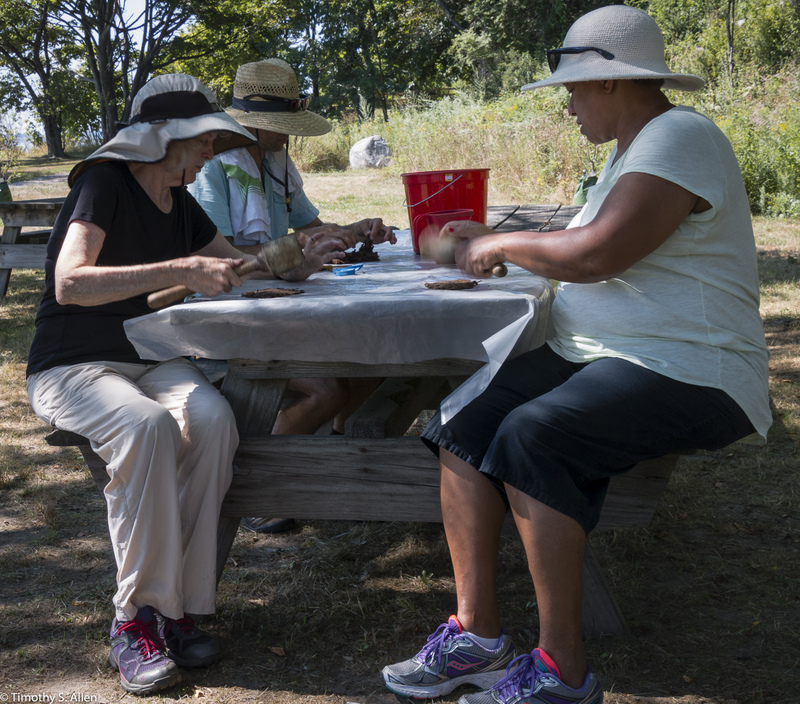 As part of my artist-in-residency project at Boston Harbor Islands National Park, I conducted public participation workshops on August 20 and 21 for making handmade paper birds using invasive plant pulps. 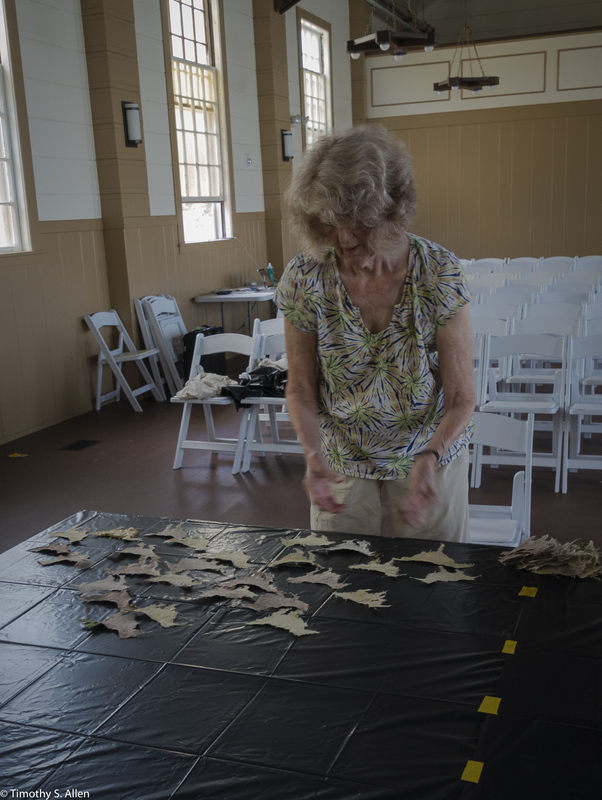 Many people visiting Peddock’s Island participated and created about 160 handmade paper birds representing endangered bird species on Peddock’s Islands. 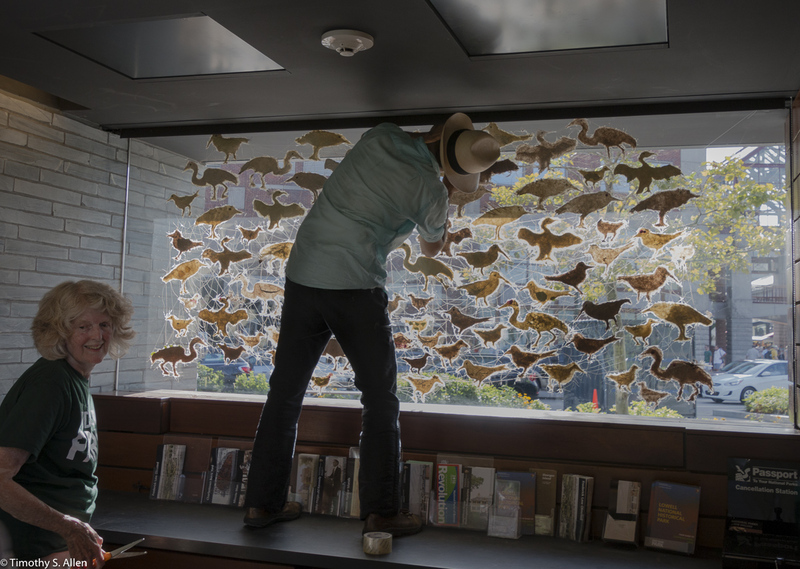 The birds that people made will be used for the large installation artwork to be installed at the Boston Harbor Islands Welcome Center at Long Wharf in Boston. 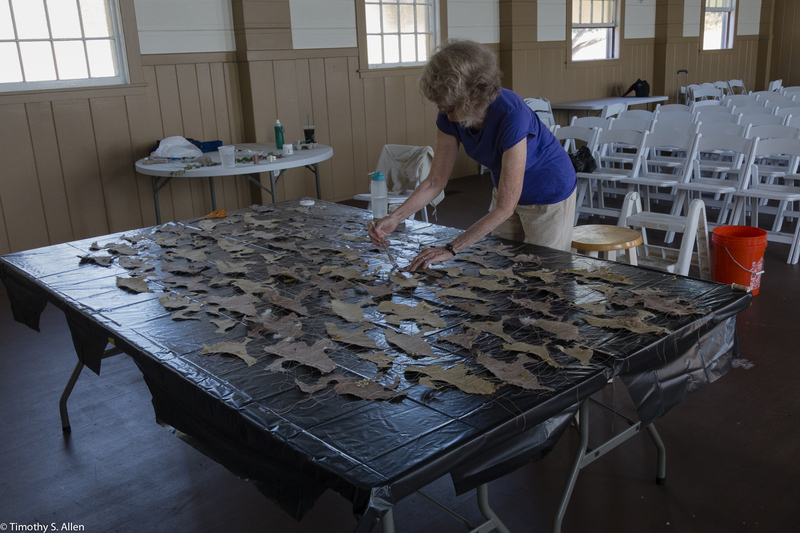 People participating had the experience of stripping the bark, beating the cooked and washed pulp material, forming sheets in the shape of 6 bird species and decorating each one individually with natural materials such as feathers, wildflowers and leaves found on Peddock’s Island. 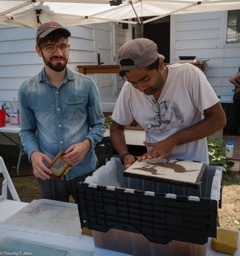 The workshops were held outdoors at a temporary papermaking studio just outside the chapel. 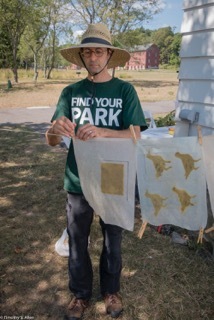 The three invasive plants of Peddock’s Island that we used for the papermaking included honeysuckle vine bark, oriental bittersweet vine bark and common reed leaves. 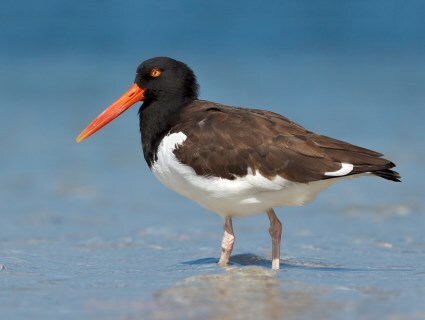 The endangered bird species represented in the handmade paper birds included cormorants, great egrets, night herons, spotted sandpipers, least terns and American oystercatchers. 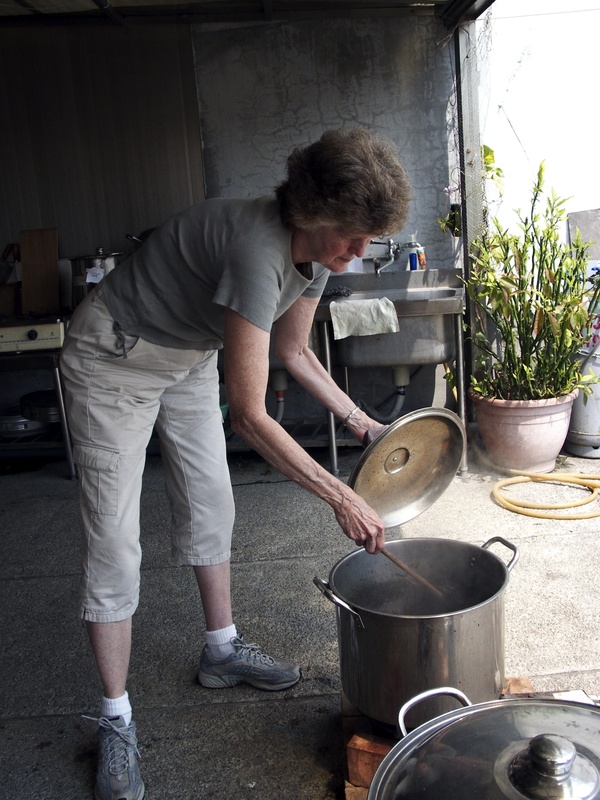 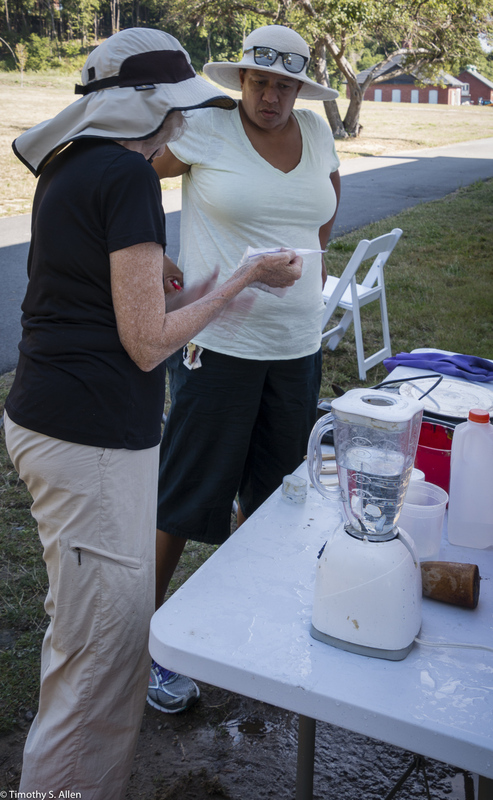 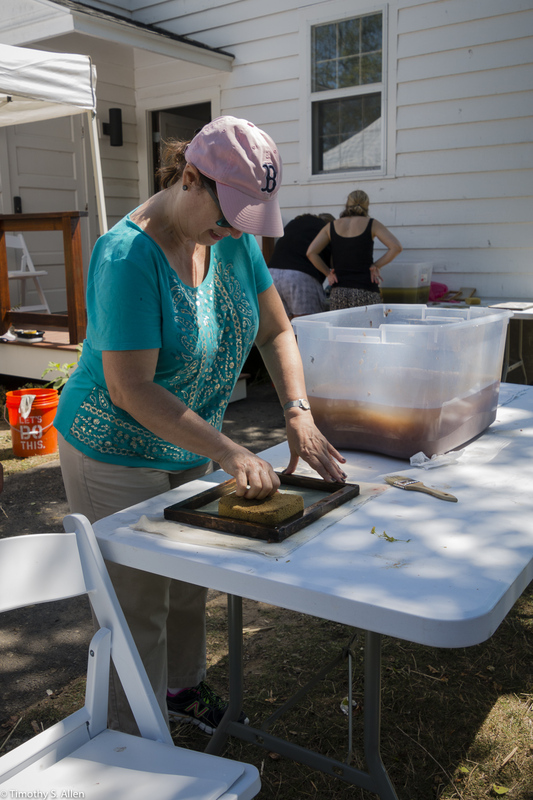 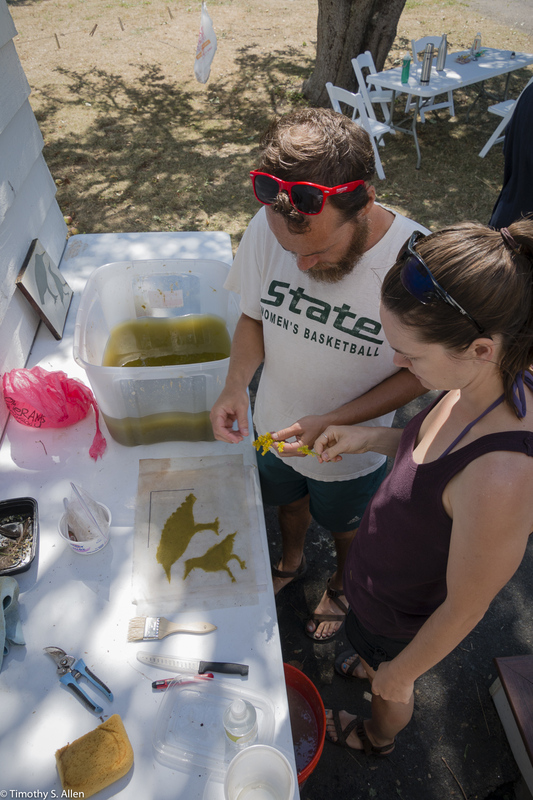 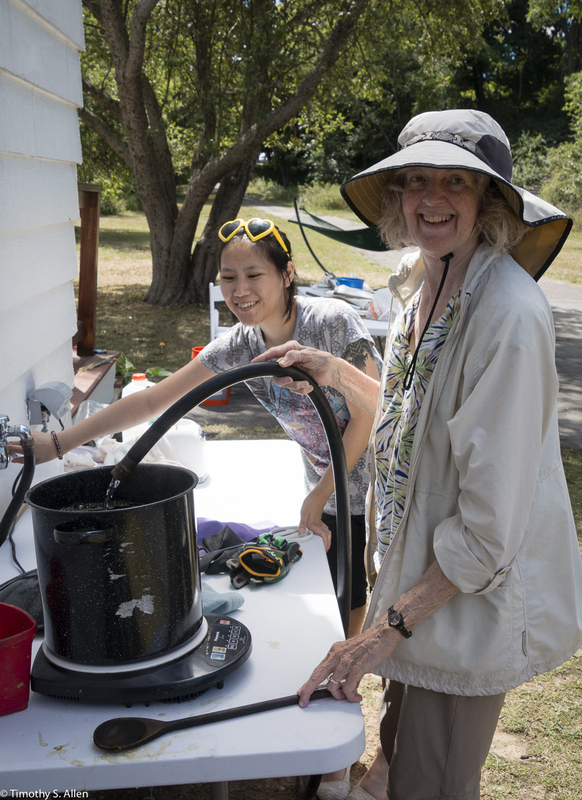 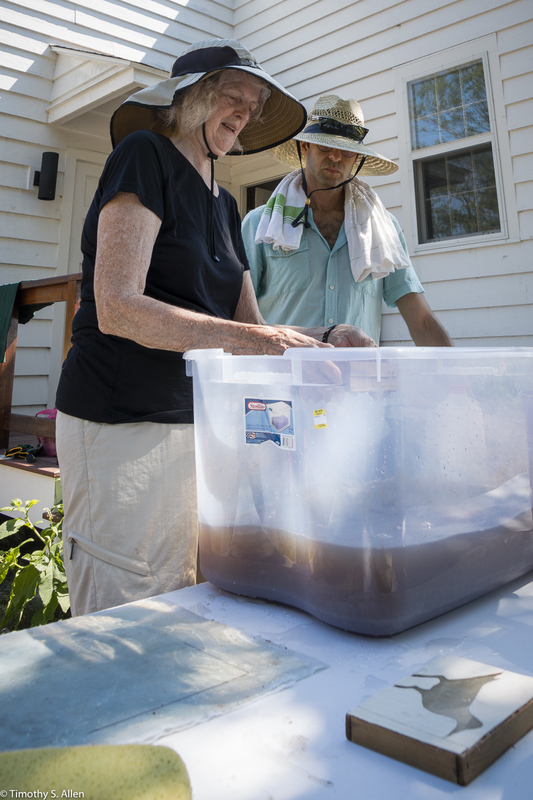 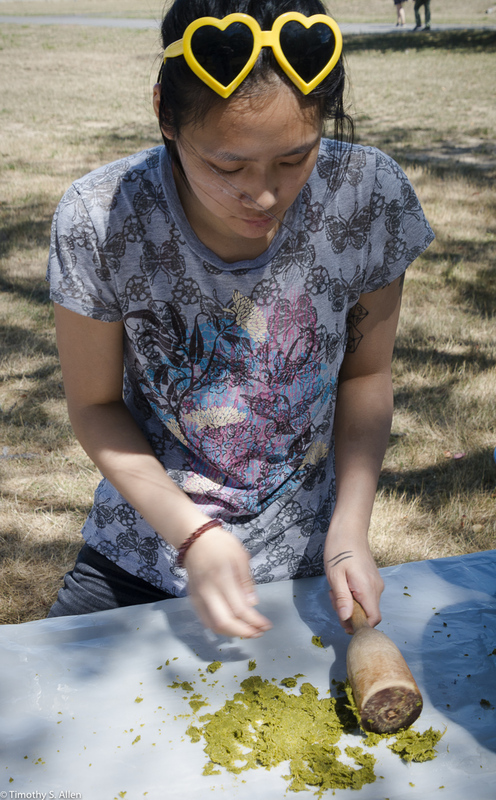 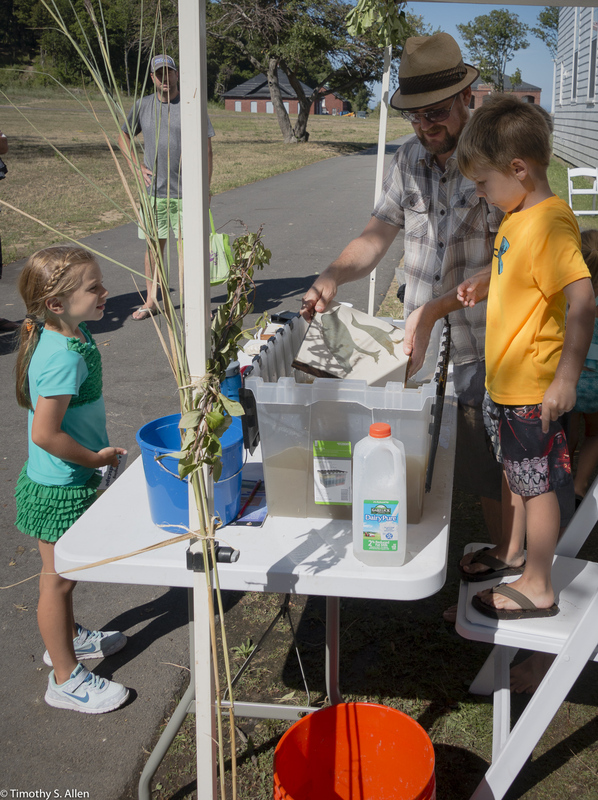 These photos show the public papermaking activities on Sunday August 21, at Peddock’s Island. 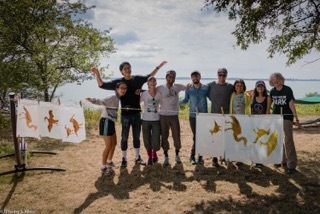 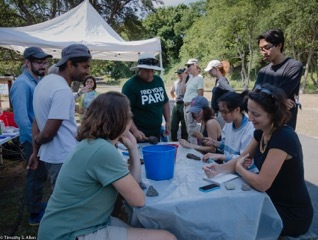 Thank you to the many people who participated in these papermakiing sessions and helped with the first artist-in-residency project at Boston Harbor Islands Naitonal Park. 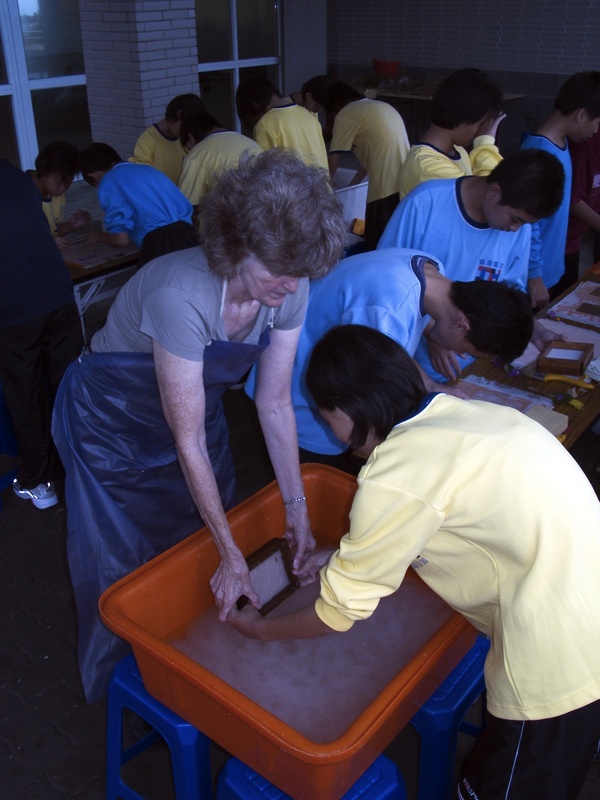 I would like also to give a big thank you to the great volunteers who helped visitors with the papermaking activities. 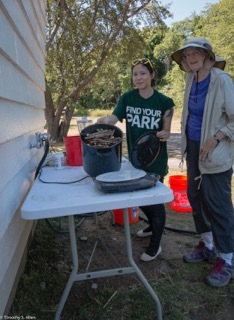 Volunteers on Saturday and Sunday included Bob and Kristina Marcus, Joyce Tat, Christine Tinsley, and Chris and Rebecca Allen and their friend Amy. 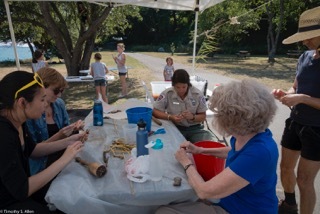 Thank you also to the artist in residency coordinator Carolyn Lewenberg and all the rangers and park foundation staff who helped with this project. 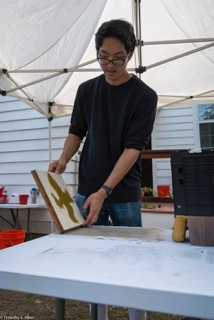 The photos for documenting this artist in residency project are by my husband Timothy S. Allen (http://allentimphotos2.wordpress.com). 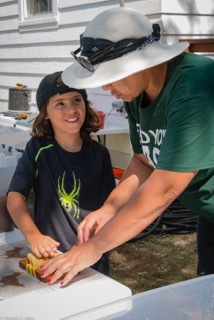 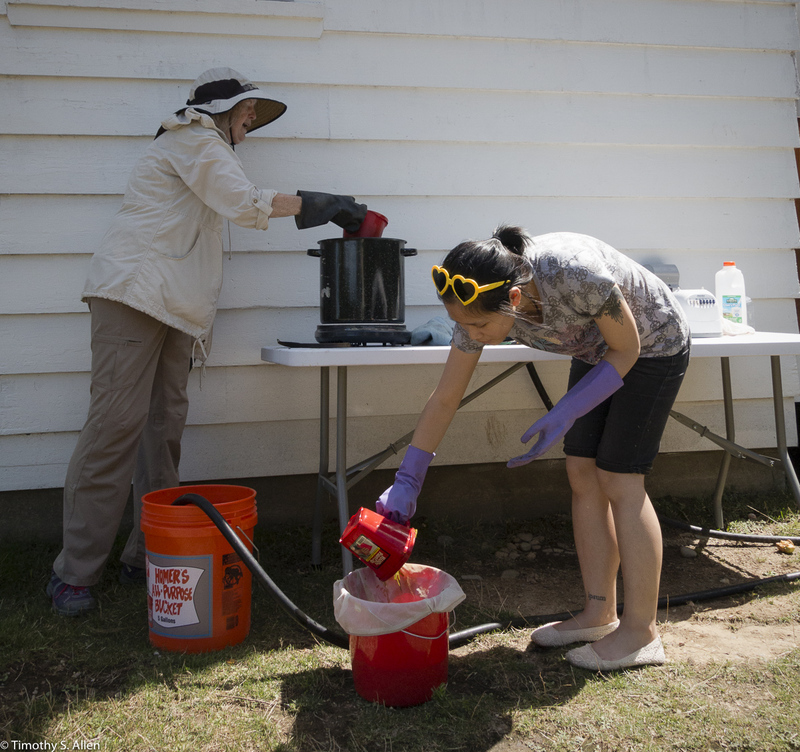 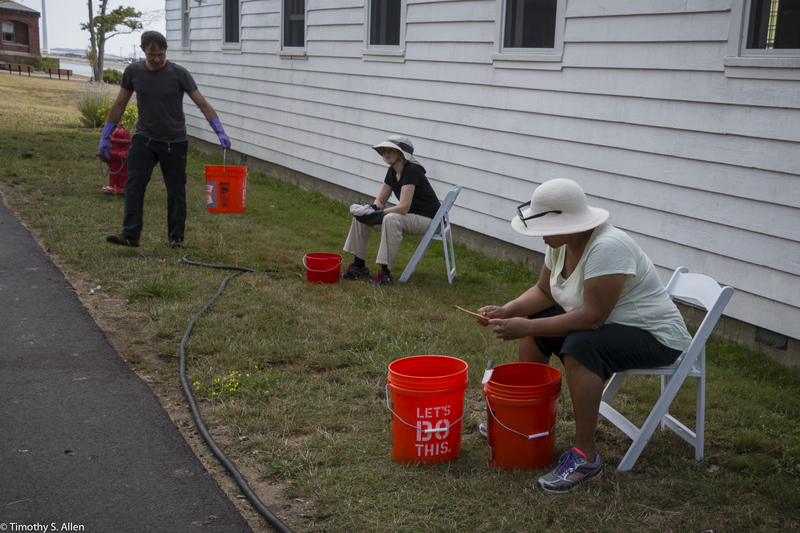 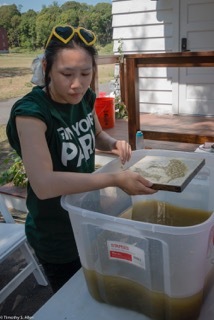 Here are some photos of the papermaking activities on Friday August 19 for my Artist in Residency project on Peddock’s Island at Boston Harbor Islands National Park. 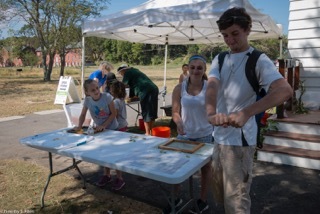 On Friday, August 19, we made paper from the invasive plant on Peddock’s Island called Oriental Bittersweet. 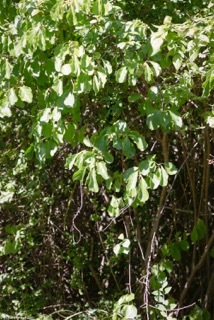 It is a vine originally from Asia that is wrapping around trees and in general making itself very invasive on the islands. 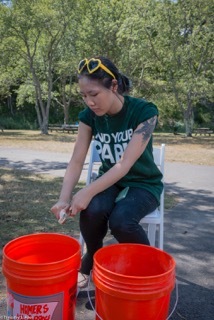 Another volunteer Christine also came to help with the papermaking, and Bob also joined us for the day of preparing pulp from invasive species and making some bird shaped paper forms that will be used in the finished installation piece to be displayed on Thursday August 25 in Christopher Columbus Park near Long Wharf in Boston for the 100th anniversary of the national parks. 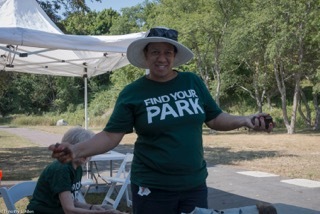 I will have a tent there in the park and be there from 2-4 PM that day. 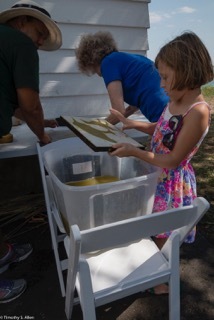 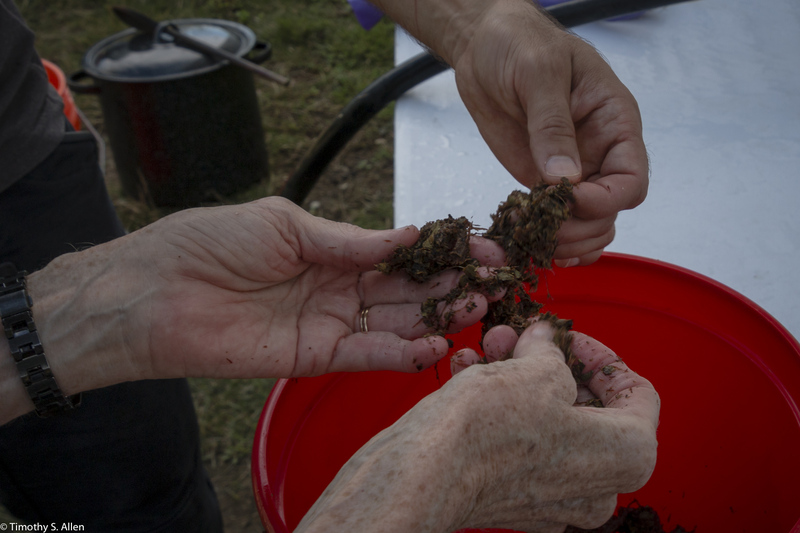 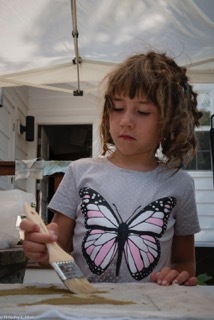 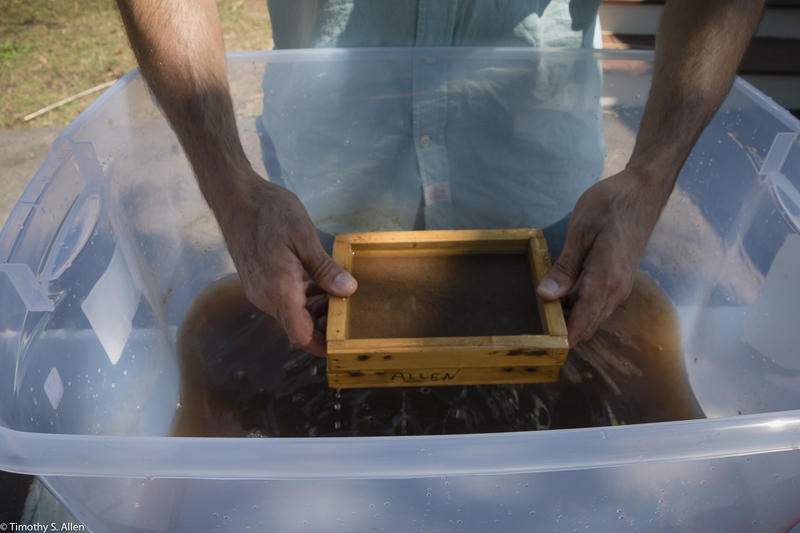 Keep watching the Blog to see more photos of the papermaking activities on Peddock’s Island. 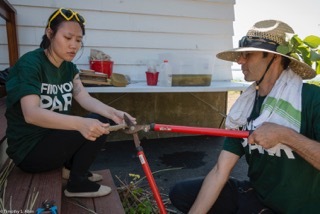 The second day, Thursday August 18, two volunteers came out to help with making paper from local invasive plants on Peddock’s Island. 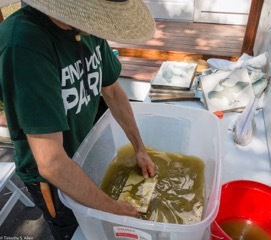 We picked some invasive Bittersweet vine to make paper. 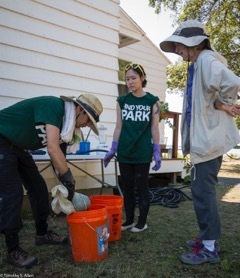 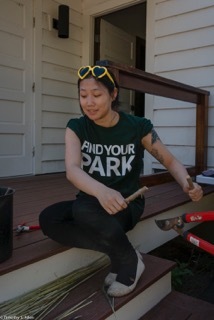 It was great to have volunteers, Joyce Tat and Bob Marcus, helping with the project. 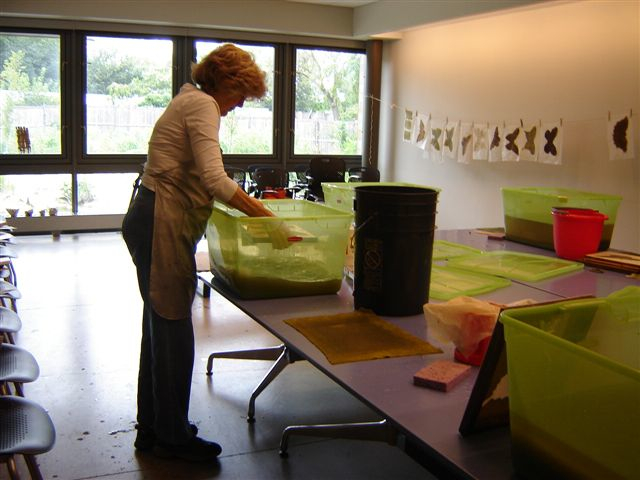 Here are some photos of the papermaking activities on the second day of the residency project. 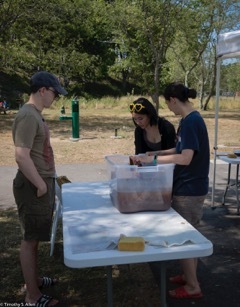 Thanks to the great volunteers and also to my husband Timothy S. Allen for taking all the photos. 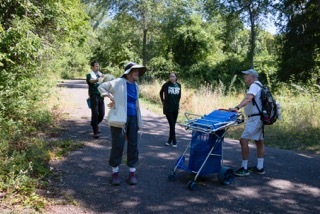 We will keep posting photos and updates about the project. 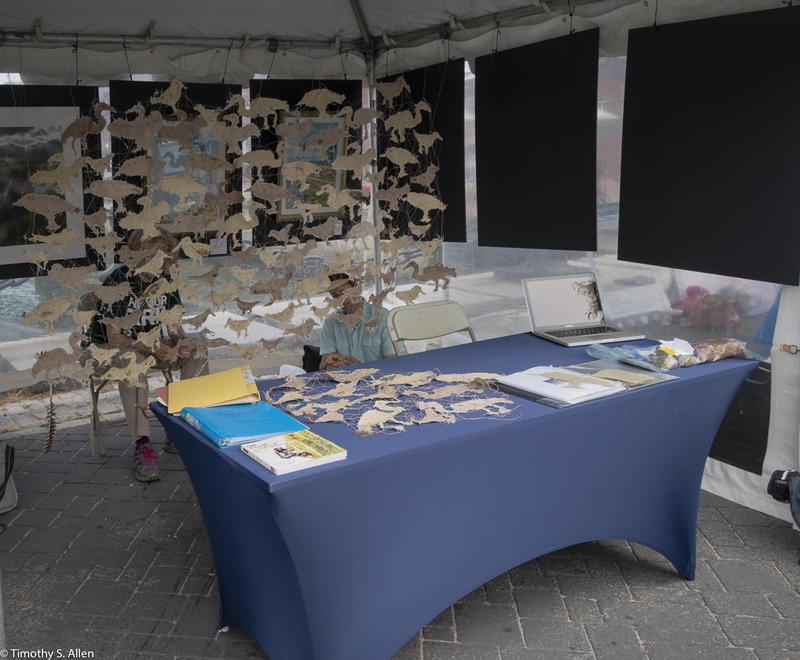 Public Open Studios will be this weekend August 20 and 21, and we hope to make lots of handmade paper birds representing the endangered species on the Islands. 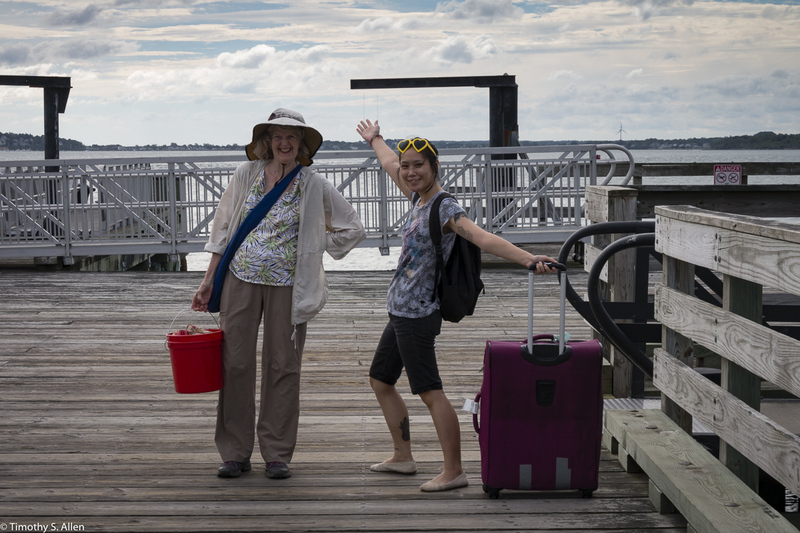 Come join the fun if you are in the Boston area and take the ferry to Peddock’s Island. 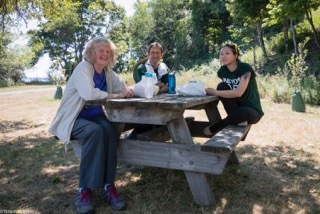 August 17 was the first day of my artist in residency project at Peddock’s Island, Boston Harbor Islands National Park. 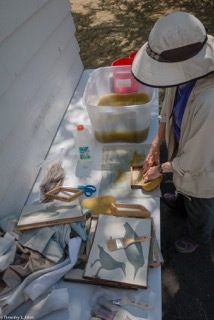 Joyce, who is a recent graduate from Montserrat College of Art in Beverly MA, came to volunteer for the papermaking AIR art project, and we started preparing some Phragmites (Common Reed) leaves and made samples and tried out some of the stencils I created to make paper in the shape of some of the endangered bird species found on Peddock’s Island. 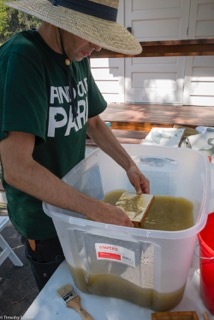 The Phragmites paper turned out really strong and sturdy and a nice golden brown color, even though it looks green when the pulp is wet! 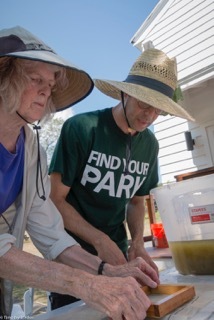 Two other volunteers will be coming to help on Thursday and Friday to prepare pulp from other invasive plants. 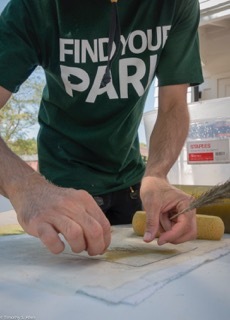 On Saturday and Sunday, August 20 and 21 the public will be invited to participate in the papermaking activities and hopefully we can create hundreds of handmade paper birds to include in the finished installation that will be ready by next Thursday, August 25 for the celebration in honor of the 100th anniversary of our national parks. 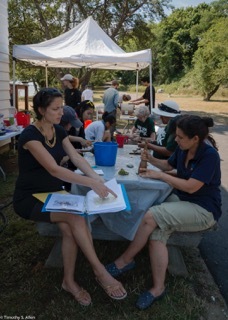 I will have a booth for this celebration at Christopher Columbus Park and be there from 2-4PM on Thursday, August 25. 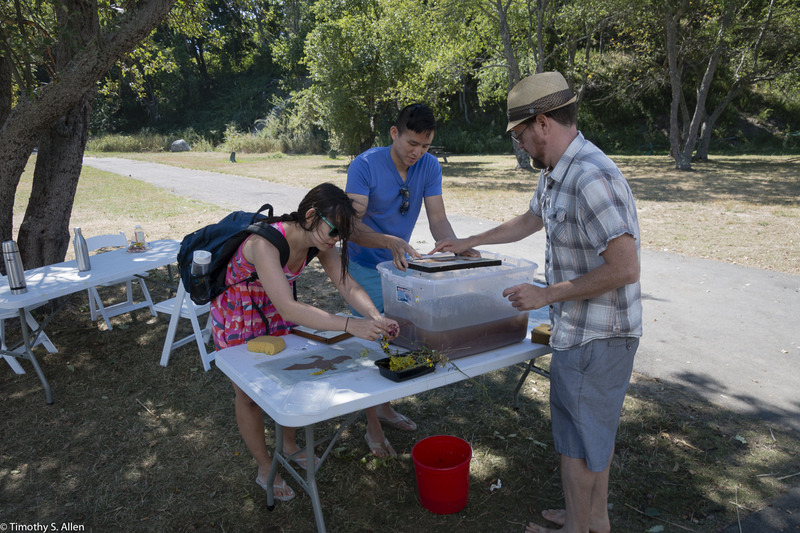 Boston Harbor Islands Residency starts tomorrow! 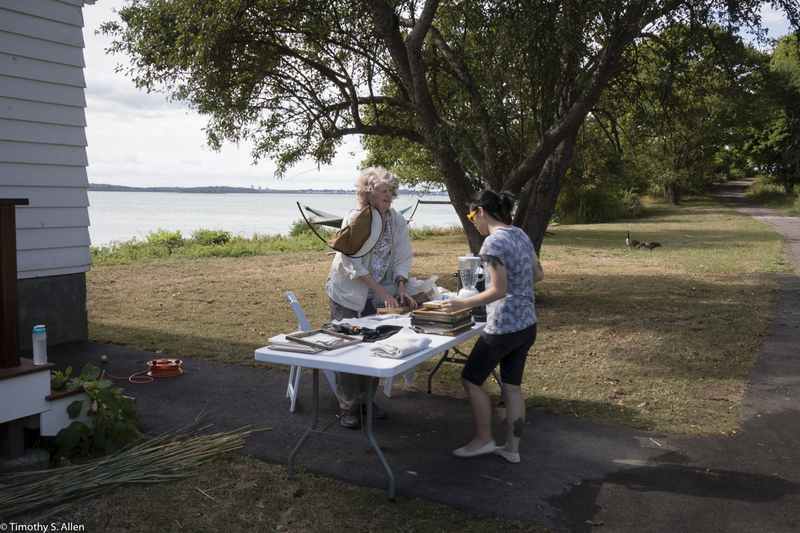 Wednesday, August 17, will be the first day of my Artist in Residency Project at Peddock’s Island in the Boston Harbor Islands National Park. 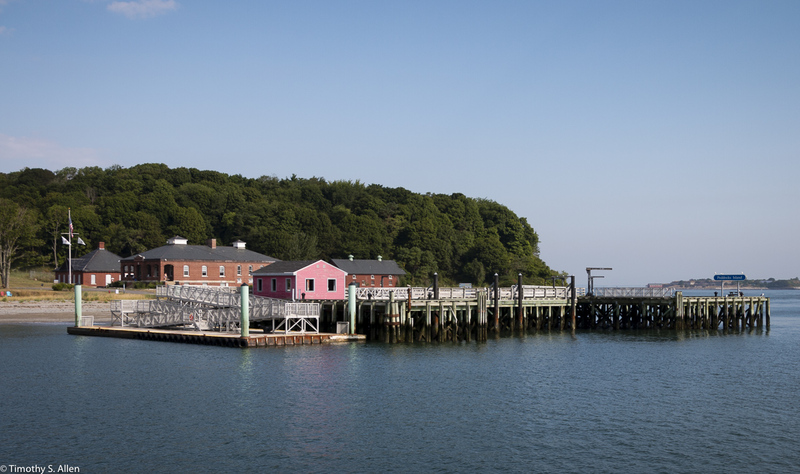 This photo shows the ferry landing at Peddock’s Island. 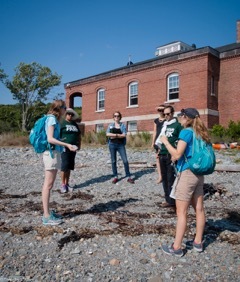 There is a visitor’s center and remains of many old buildings on Peddock’s Island as well as some nice hiking trails. 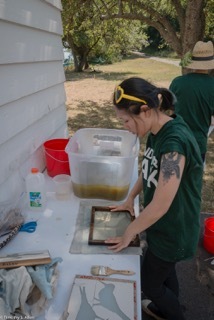 During this residency I will be making handmade paper from invasive plants found on Peddock’s Island. 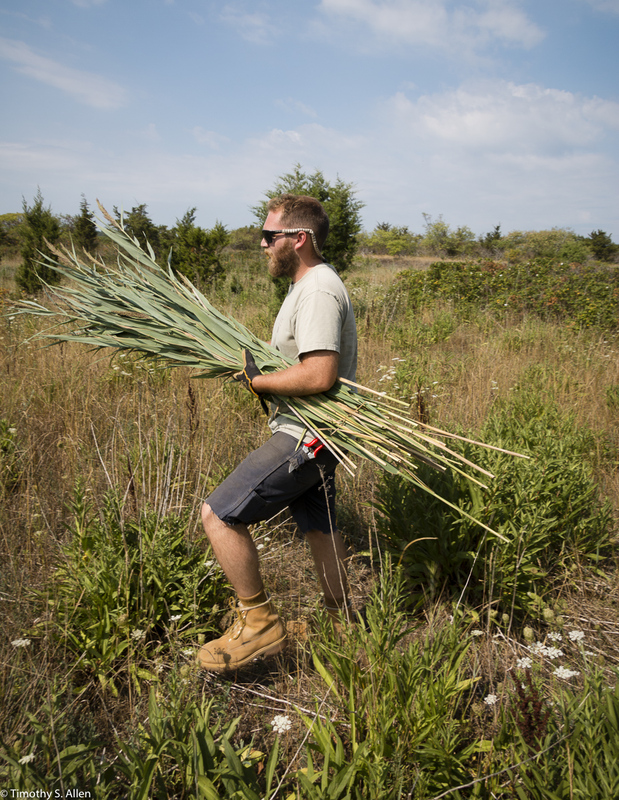 Here is a photo of one of the rangers collecting some Phragmites australis (Common Reed) that is one invasive plant that can make paper. 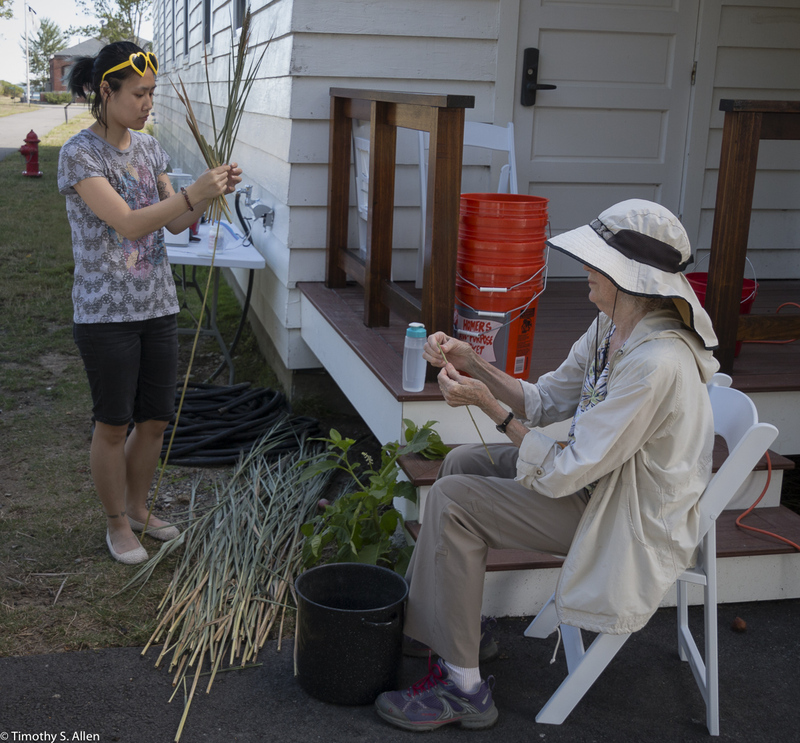 This plant originally from Asia is growing too much now on Peddock’s and out competing many native plants to take over in certain areas. 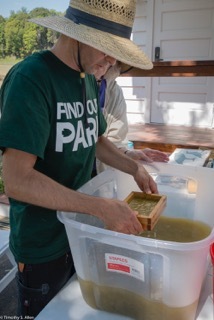 The rangers are happy to have me use some of this material to make handmade paper for my artwork. 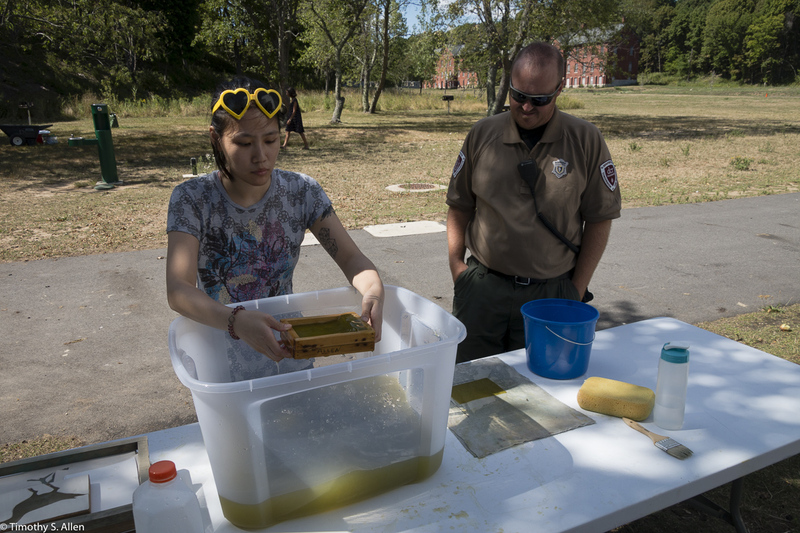 I will also try some of the other invasive plants for papermaking during this residency project. 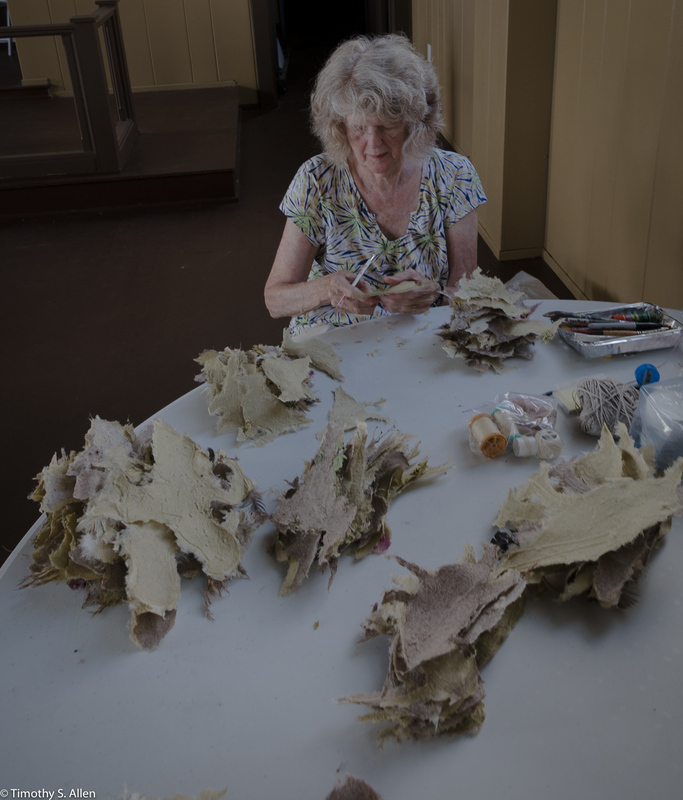 I will be creating a mixed media installation with handmade paper and natural thread that will be about the endangered birds on Peddock’s Island. 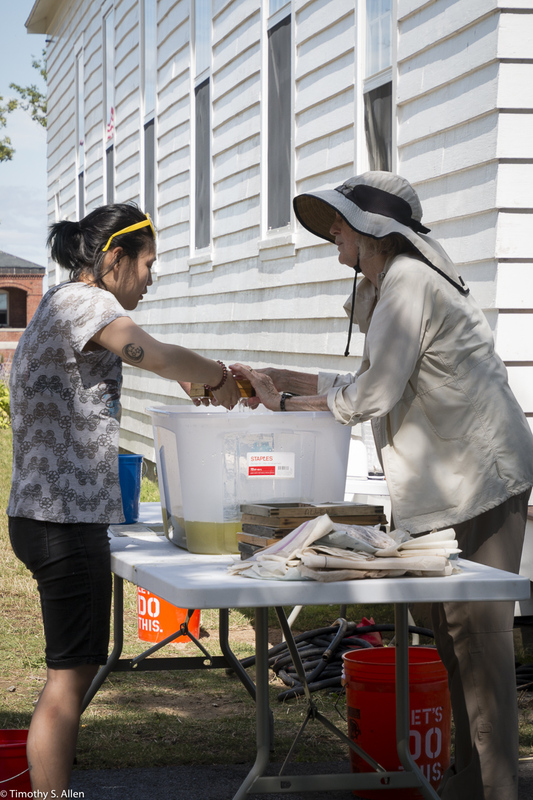 I will be having open public workshops at Peddock’s Island in a temporary papermaking studio set up near the chapel area. 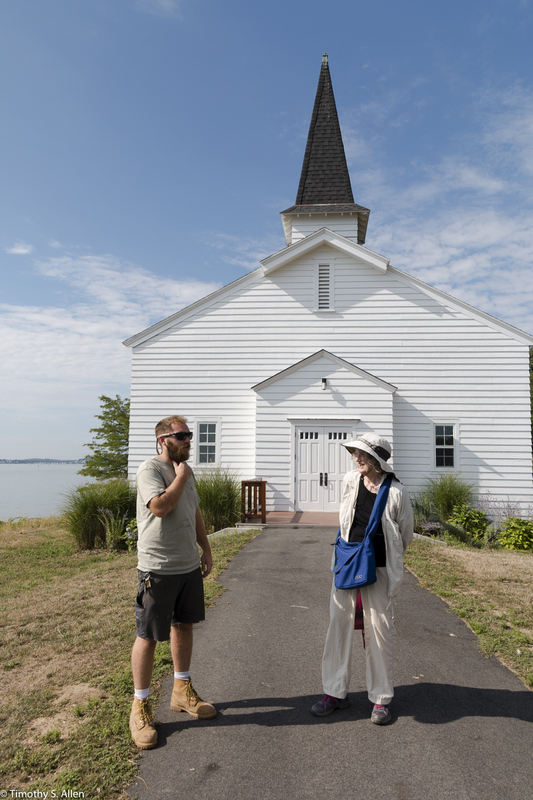 During a pre-residency tour of Peddock’s Island last Thursday, I met with Carolyn Lewenberg and some of the Park’s staff and Boston Harbor Now staff to talk about the residency project and see the chapel area and other facilities. 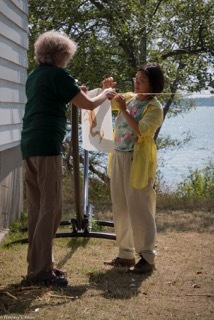 Jane and park staff talking about the residency project at the chapel area on Peddock’s Island. 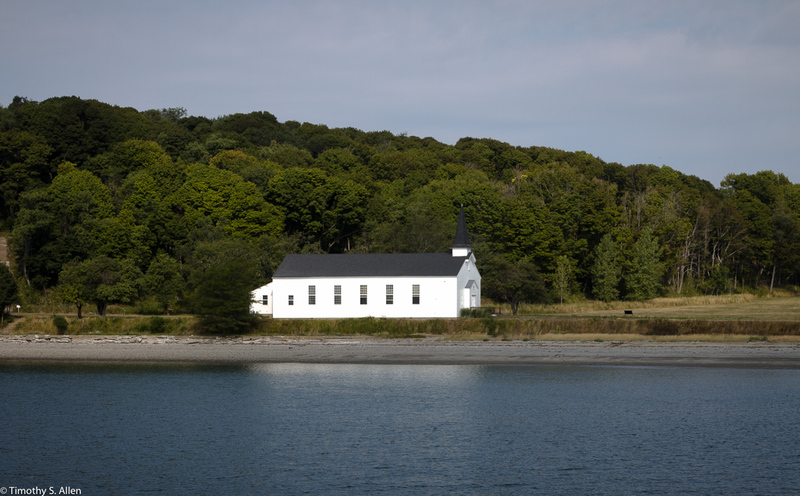 Chapel on Peddock’s Island where the temporary papermaking studio will be set up from August 17-24, 2016. 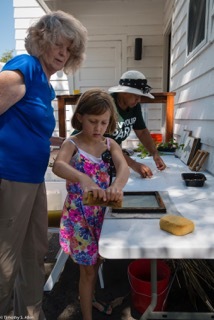 The papermaking public activities will be Saturday, August 20 and Sunday, August 21, from 10:30 – Noon and 2 -4 PM each day. 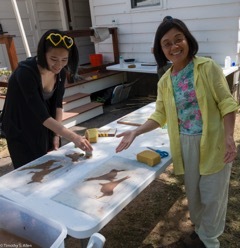 Stop by and join in to help make many handmade paper bird shapes for the installation. 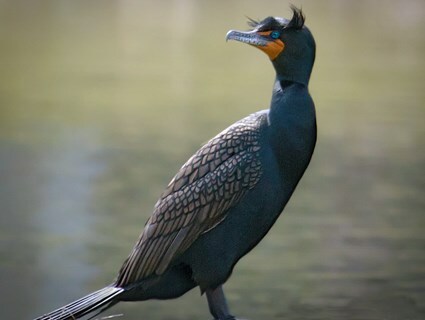 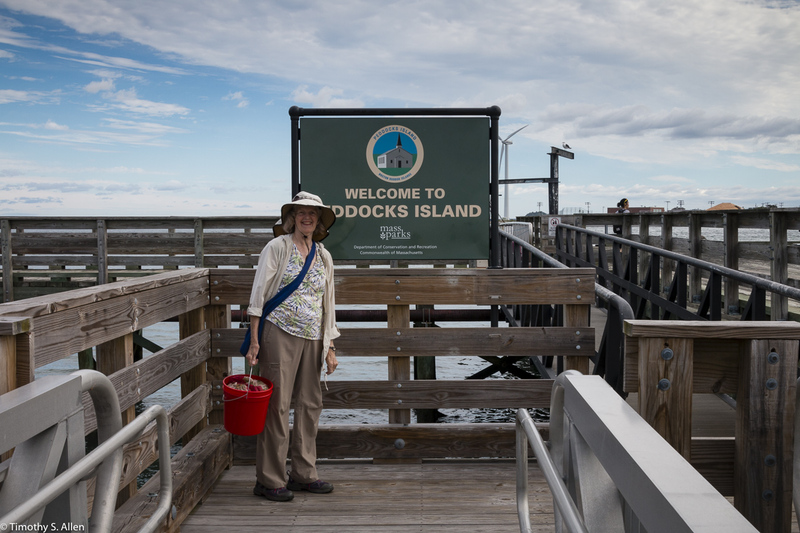 Also, there will be a Bird Walk at 9:30 – 10:30 AM on Saturday and Sunday mornings, on Peddock’s Island, led by staff from the Mass Audubon Society to watch for birds and learn more about endangered birds on the Boston Harbor Islands. 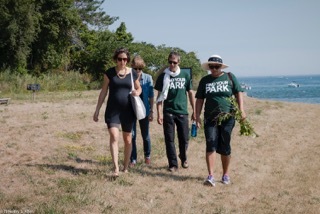 On Saturday, August 20 from 12-1:30 you can also join an Invasive Plants Walk with stewards on Peddock’s Island to learn about the invasive plants. 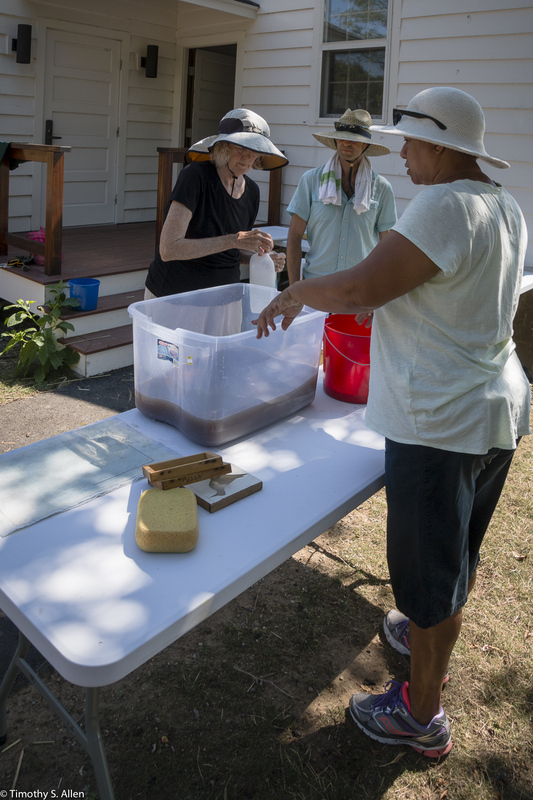 The Walks will end back at the papermaking studio so people can also join in the papermaking activities. 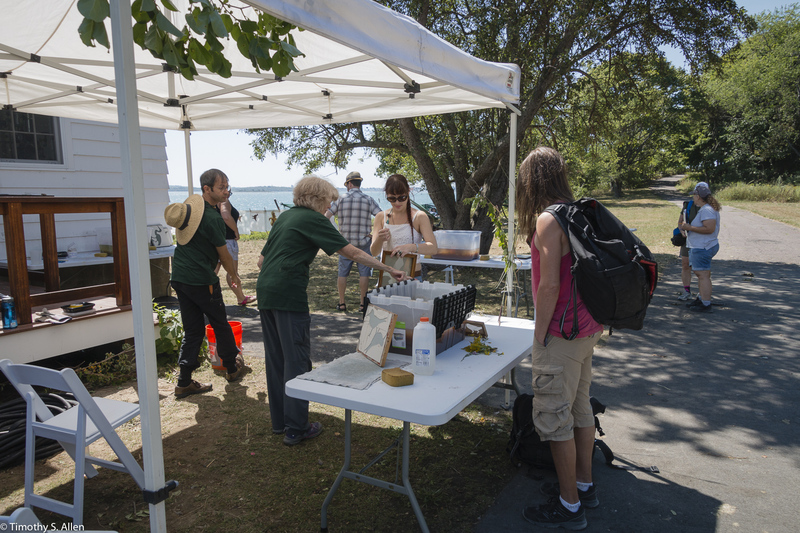 Hope to see you on Peddock’s Island this weekend. 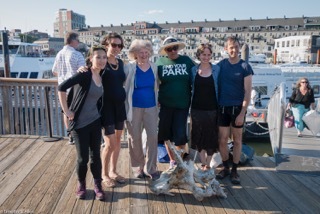 Public ferries are available to the islands from Long Wharf in Boston. 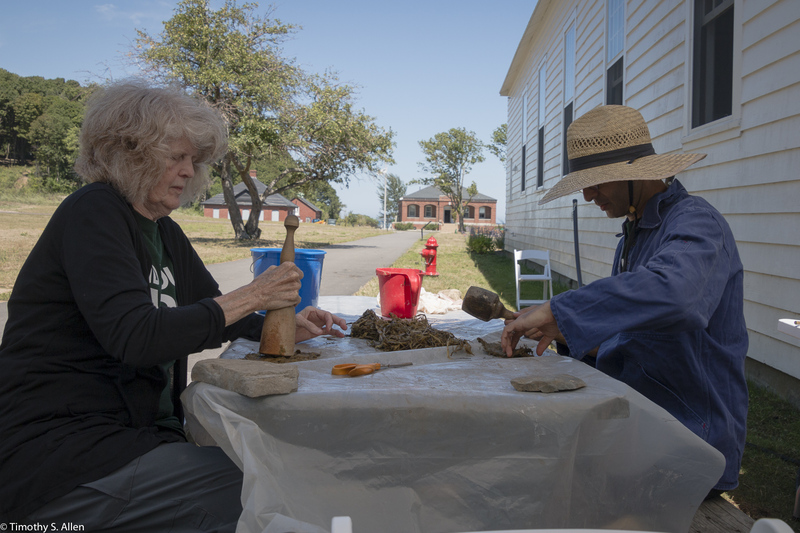 Jane Ingram Allen will be the first artist-in-residence at Boston Harbor Islands National Park, Peddock’s Island, from August 17-24, 2016. 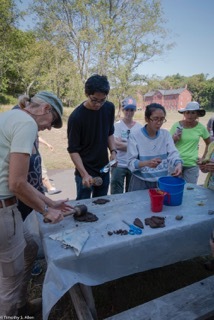 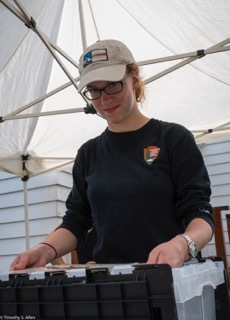 This residency project is supported by the Boston Harbor Islands National Park Foundation, and Carolyn Lewenberg is the Artist in Residency Coordinator. 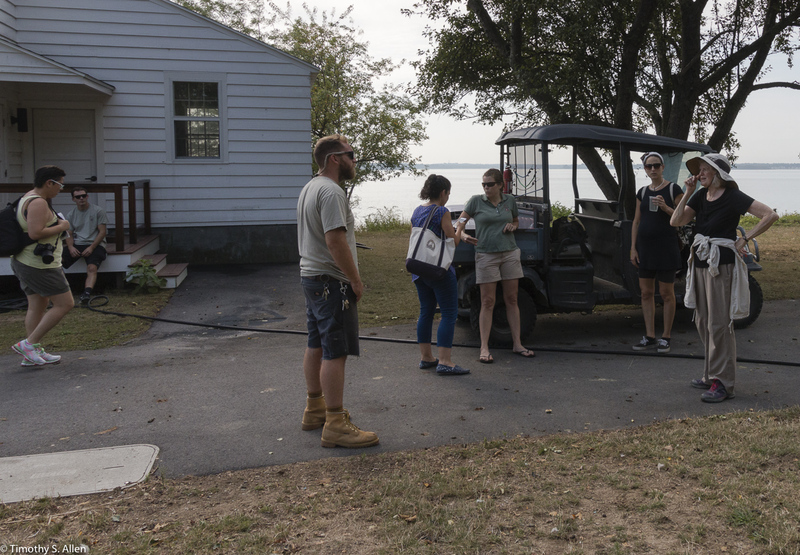 it is hoped that this pilot artist- in-residency project will lead to an ongoing program of artists working as artists in residence on the Boston Harbor Islands. 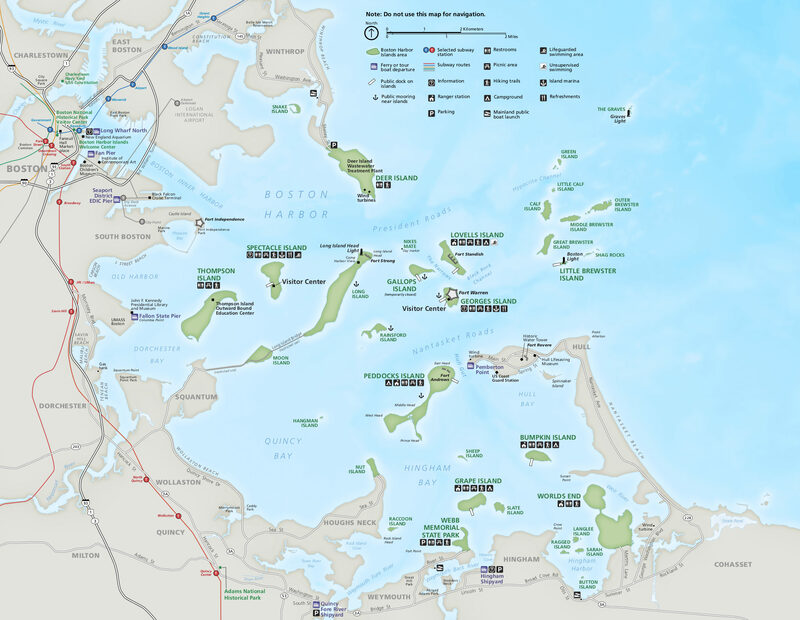 There are 34 islands in the park, and most of them are accessible by public ferry boats from Long Wharf in Boston and other spots. 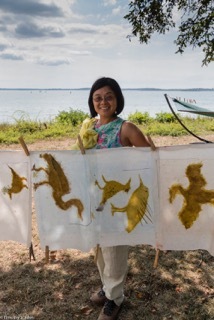 Jane Ingram Allen is an international artist with a specialty in hand papermaking and environmental art using local natural materials and sustainable processes. 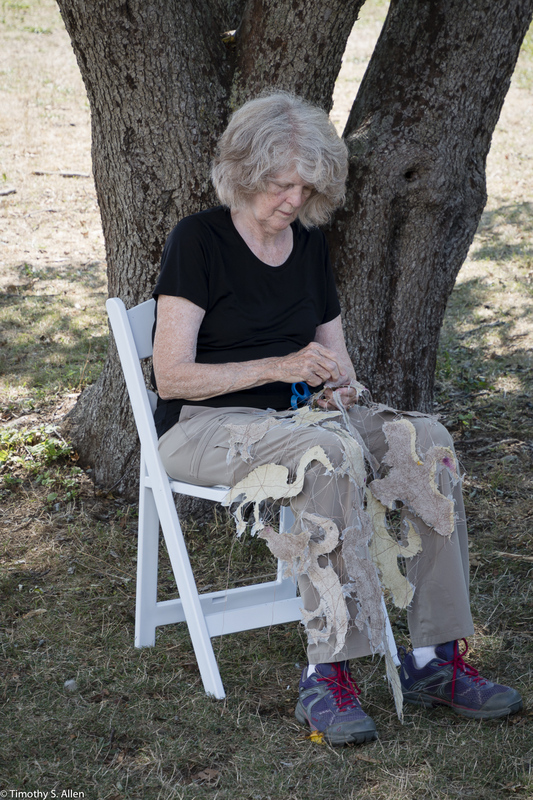 Most recently Jane has been an artist-in-residence at Fire Island National Park, NY, and at Ege University, Izmir, Turkey, with a Fulbright grant. 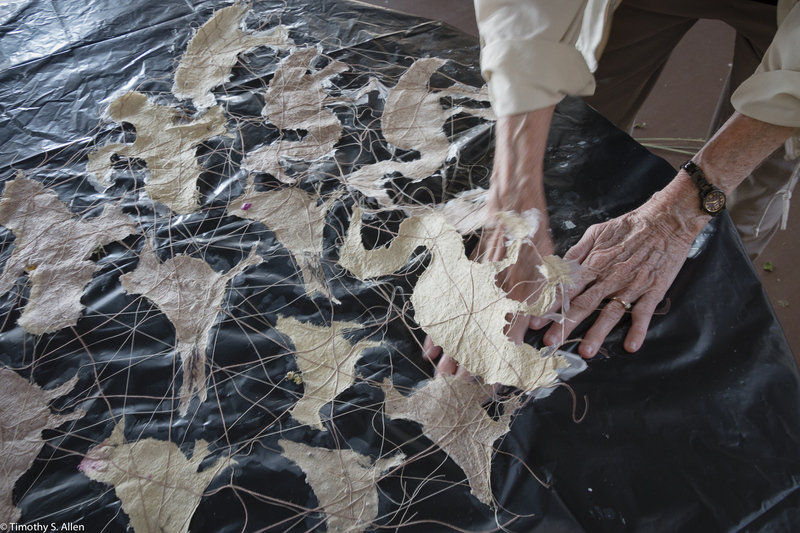 Jane has also been awarded grants for artist residency projects in Taiwan, Japan, the Philippines, Nepal, Brazil, China and Tanzania as well as many places in the USA such as the Lancaster Museum of Art & History, Lancaster, CA. 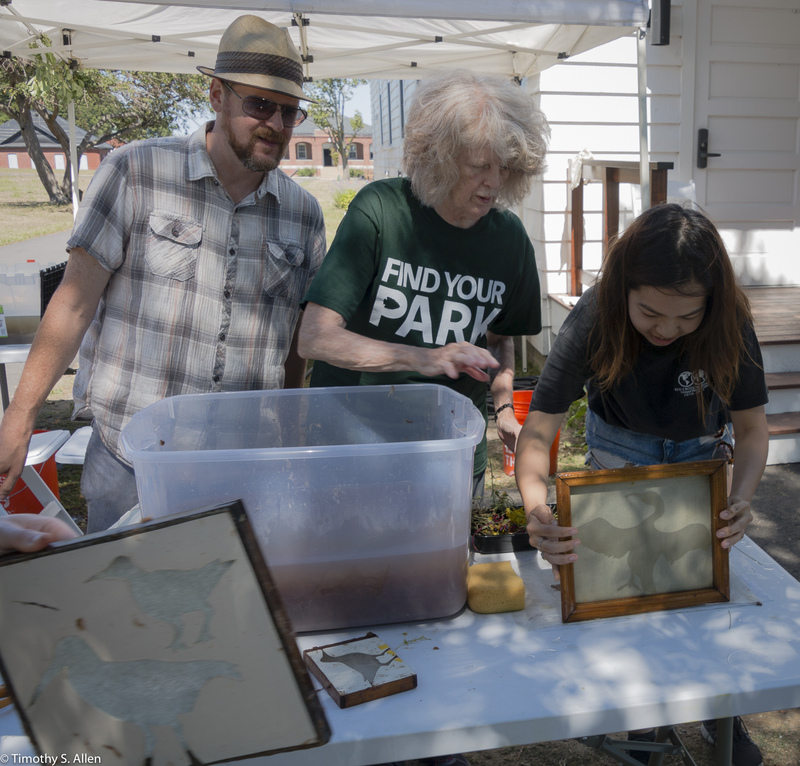 the Sitka Center for Art & Ecology, Otis, Oregon, the Museum of American Bird Art at Mass Audubon, Canton, MA, and the Queens Botanical Garden, NYC. 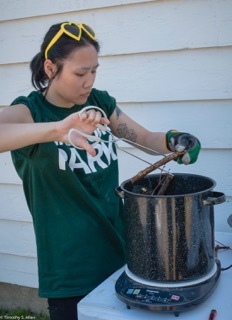 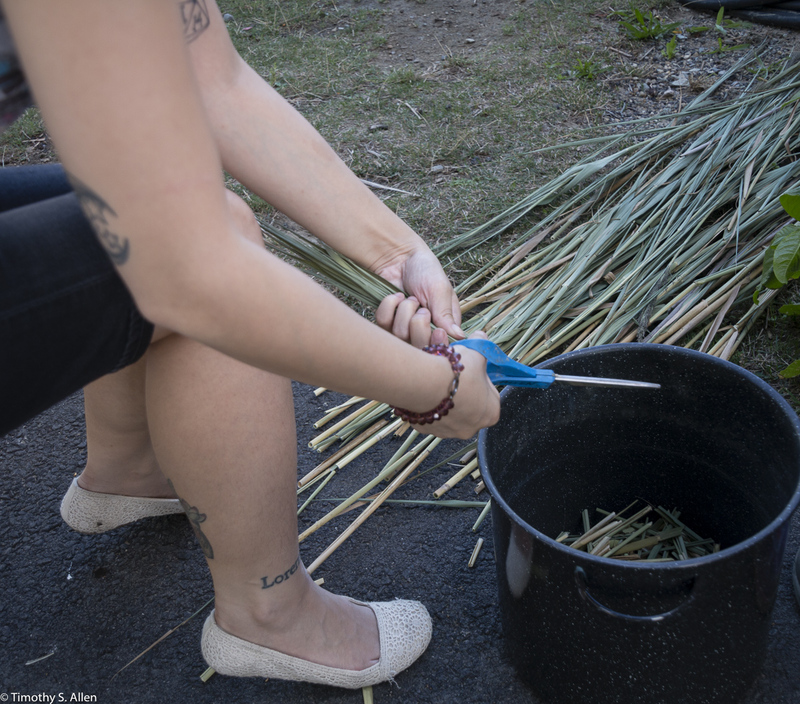 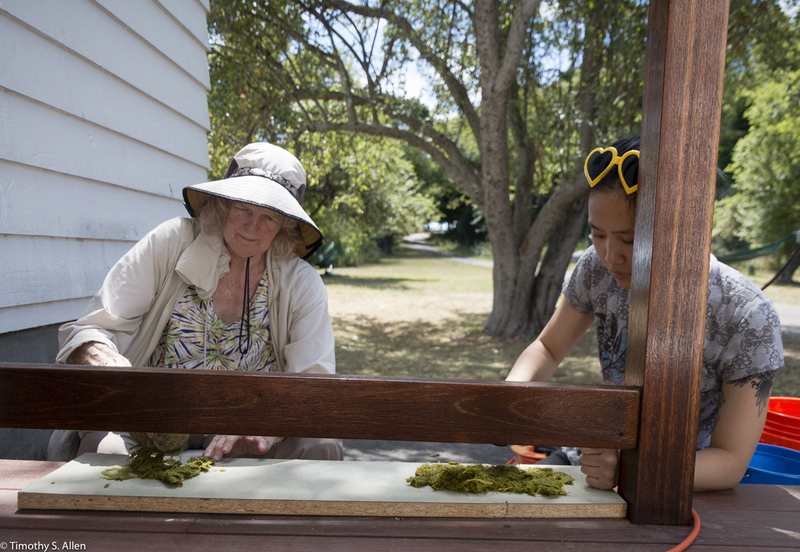 While staying on Peddock’s Island Jane will create a public participation installation using handmade paper made from local invasive plant materials such as Phragmites leaves and Oriental Bittersweet vines. 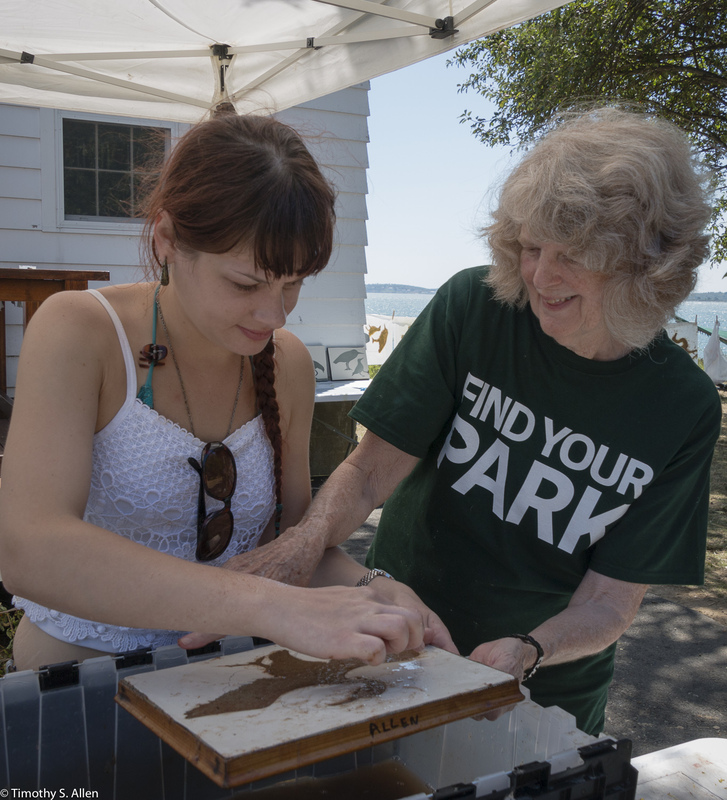 Her installation will raise awareness about invasive plants and focus on the endangered birds of Peddock’s Island, such as the Least Tern, American Oystercatcher, Double-crested Cormorant, Black-Crowned Night Heron, and others that are on the priority species list. 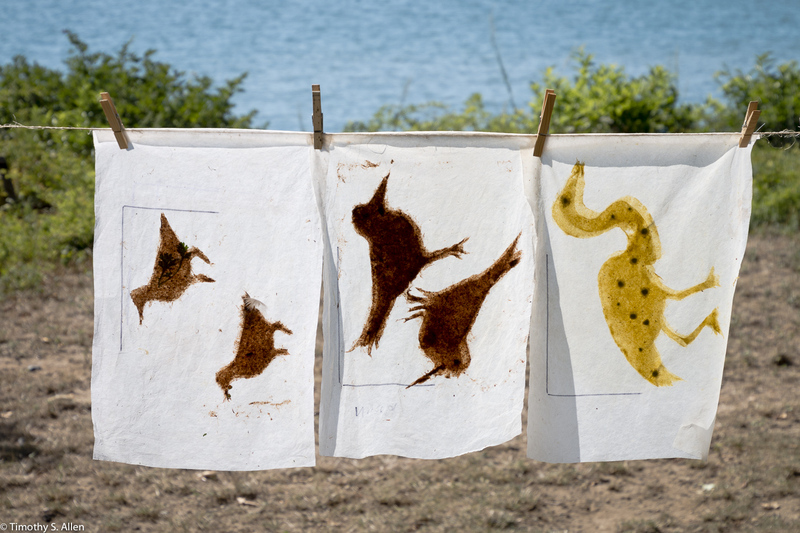 During the residency Jane will engage visitors of all ages in hand papermaking workshops to create handmade paper bird shapes for a collaborative art installation titled “Peddock’s Island Birds”. 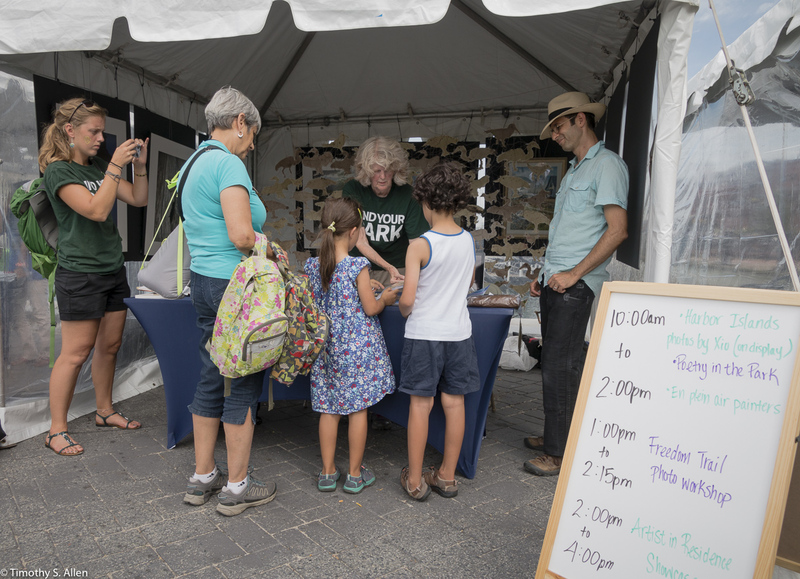 Public participation workshops will be Saturday, August 20 and Sunday, August 21, from 10AM to 12 Noon and 2PM to 4 PM each day. 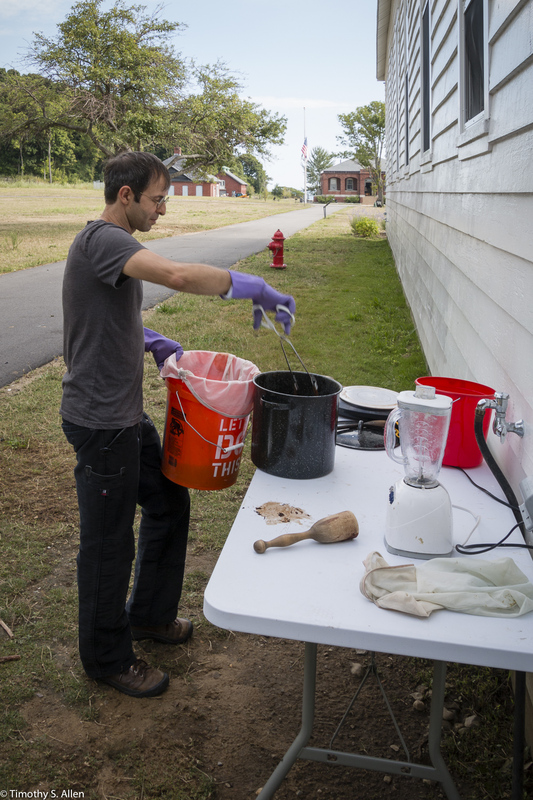 The artist will set up a temporary papermaking studio near the Visitor Center on Peddock’s Island. 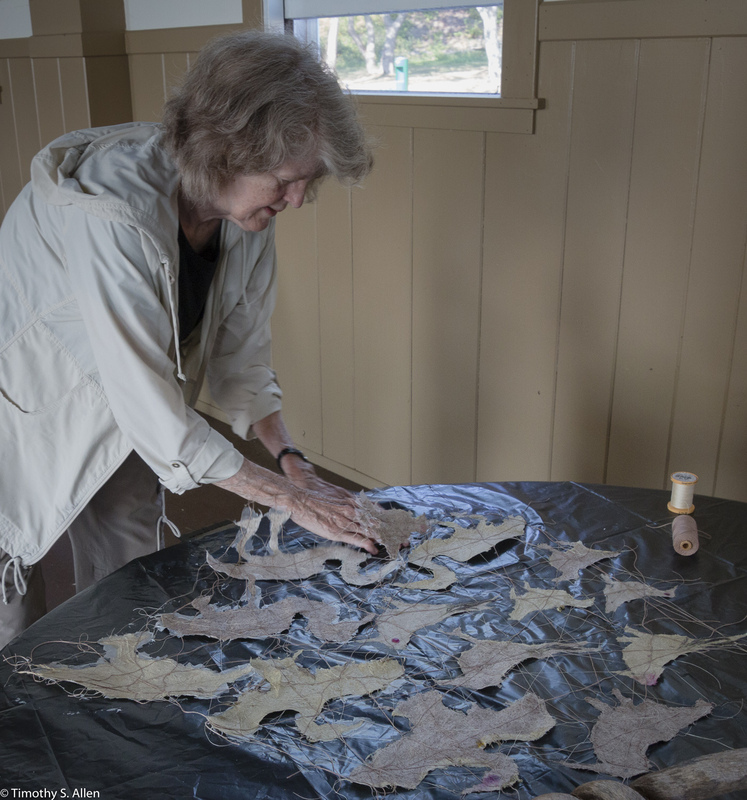 The handmade paper birds created in the public workshops will become part of the finished art installation that will be donated to the national park. 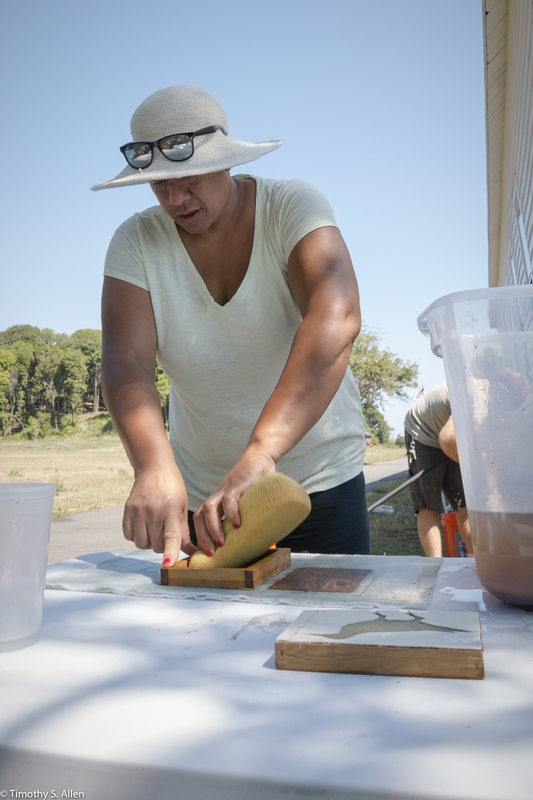 During the week of August 17-24, the artist will also have Open Studio times, and the public is invited to come meet the artists and help with the papermaking during posted times. 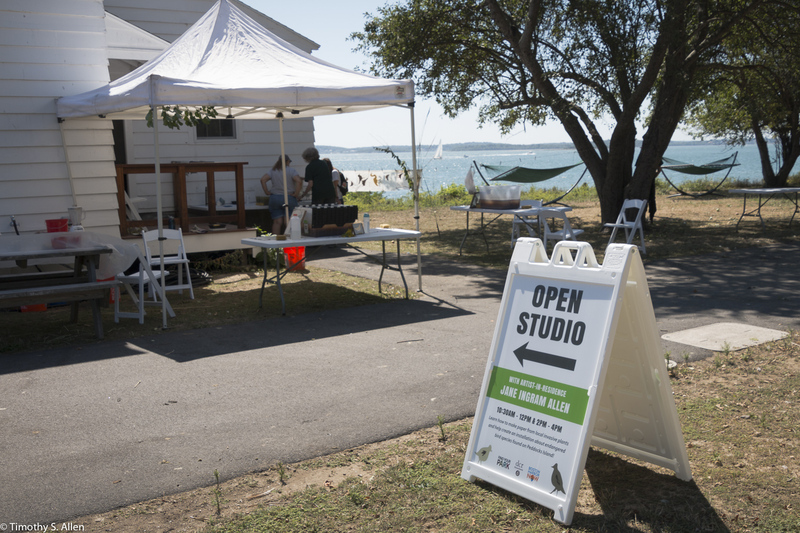 Look for the “Open Studio” signs near the ferry landing at Peddock’s Island. 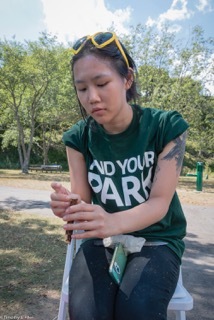 The artist will also give a brief informal presentation about the artist-in-residency project from 2-4 PM at Christopher Columbus Park, Boston, in conjunction with the day-long national park celebration of 150 Years of the nation’s national parks. 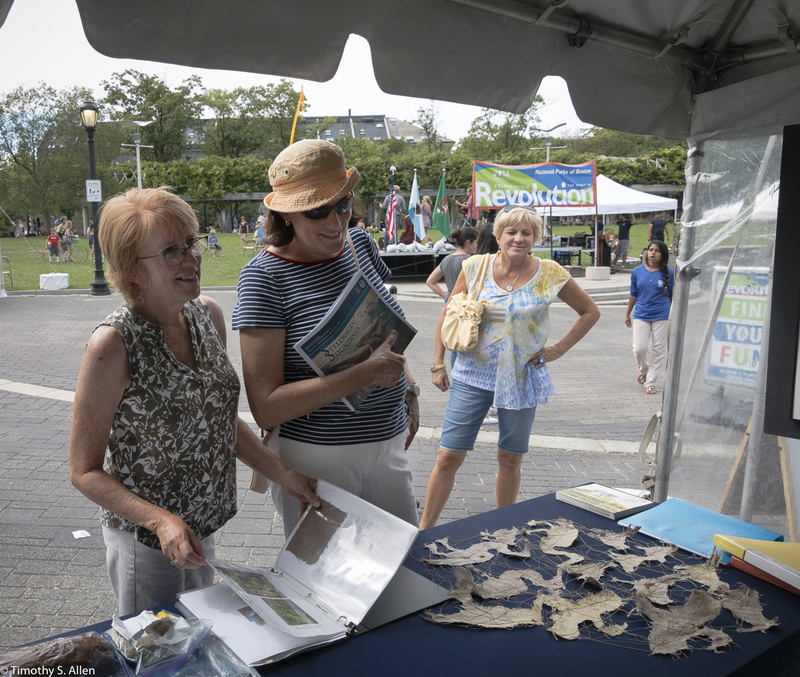 Come to visit Jane in her tent at the festival and see her finished art installation “Peddock’s Island Birds” and also view the sample book of handmade paper created from invasive plants of Peddock’s Island.